12/19/08 Six Preview Pages of Nova #20! 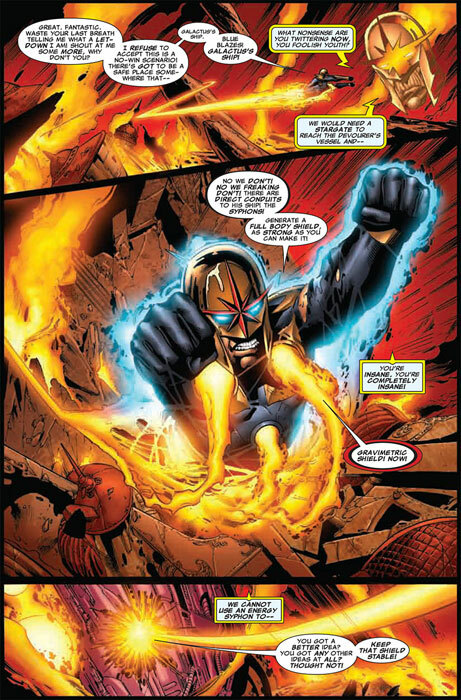 Marvel has released six preview pages from Nova #20! The issue is written by Dan Abnett and Andy Lanning and art by Wellinton Alves and Scott Hanna. The issue is on sale December 24th! 12/16/08 War of Kings #1 Solicitation! War of Kings #1 - Written by Dan Abnett & Andy Lanning, pencils by Paul Pelletier with covers by Brandon Peterson, Ron Lim and Leinil Francis Yu. In the aftermath of the Secret Invasion, Black Bolt has led the Inhumans on a shockingly savage path to restore their strength and security. But that path has brought them into direct confrontation with the Shi'Ar Empire - and their mad ruler Vulcan! Who will get in the first strike? Who will fall on the bloody battlefield? Who will rule? The Imperial Guard, the Starjammers, the Inhuman Royal Family and more of your favorite sci-fi characters are locked on a collision course...and it all starts here! 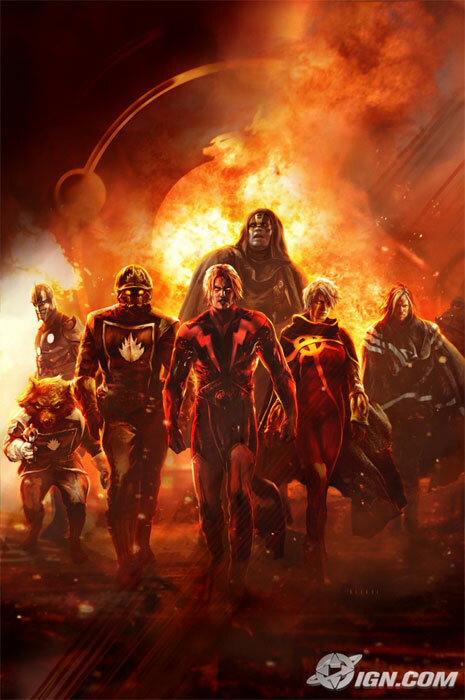 Join the acclaimed team of Dan Abnett & Andy Lanning (NOVA) and Paul Pelletier (GUARDIANS OF THE GALAXY) for a pivotal turning point in Marvel's cosmic history! The issue has multiple variant covers. Nova #23 - Written by Dan Abnett & Andy Lanning, pencils by Andrea DiVito with cover by Daniel Acuna. War of Kings brings a new status quo...and a new penciler Andrea DiVito (Annihilation)! Who is the new Protector of the Universe? Stripped of his Nova powers and facing death, Rich Rider must stop the Worldmind's plans before it's too late. But he needs power to do it, which may come from a source that will change his very identity! It's another unpredictable episode of the comic Ain't It Cool News calls "awesomely jaw-droppingly cool stuff." The issue also has a variant cover. The question was: "Do you want to see a new Nova Corps?" 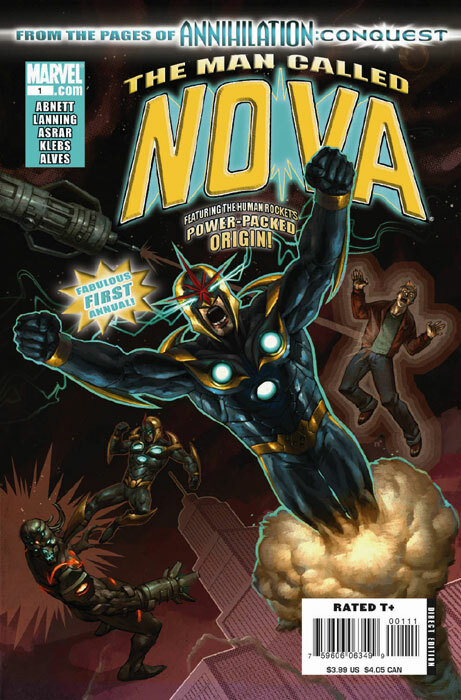 12/15/08 Nova #19 Sales Ranking / # Sold - Updated! Nova #19 was ranked #66 according to sales numbers released by Diamond Comics Distributors. The estimated number of issues sold was 28,306. 12/15/08 Preview Covers of War of Kings! Marvel has provided preview covers to War of Kings Saga, War of Kings #1 (both versions) and Secret Invasion: War of Kings! 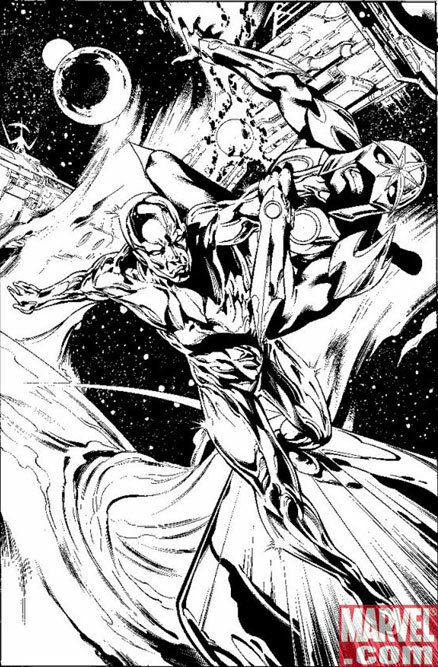 Nova appears on the cover to War of Kings Saga and the Ron Lim version of War of Kings #1!! Special Thanks to Bill Rosemann and Arune Singh for the scans! 12/11/08 Hasbro Nova Action Figure Update! Hasbro has released a photo of the packaging for the Nova action figure! The figure is part of the Nemesis wave of action figures and will be available as a Walmart exclusive. Nova will be available at Walmart in December. 12/5/08 A Look at Nova #23's Cover! 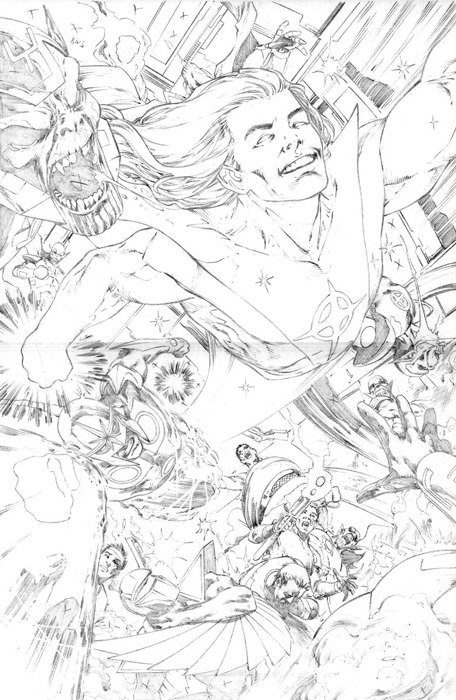 Joe Quesada, on Marvel's My Cup O' Joe column, previewed the cover to Nova #23! The art is by Daniel Acuna and Nova #23 is on sale in March! 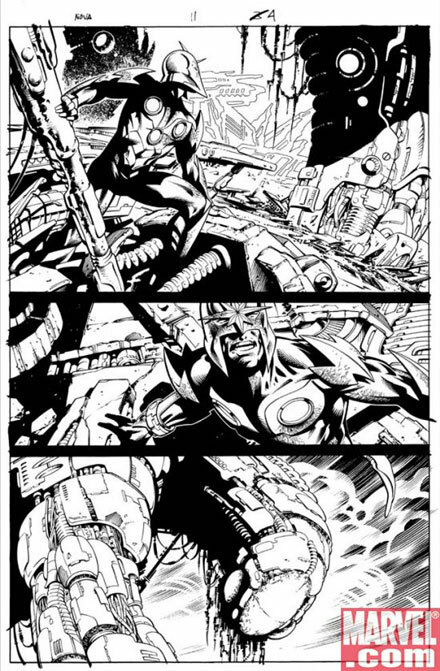 12/4/08 Three Preview Pages of Nova #20! Marvel has released three preview pages from Nova #20! The issue is written by Dan Abnett and Andy Lanning and art by Wellinton Alves and Scott Hanna. The issue is on sale December 24th! Also, make sure to check out an interview with DnA at Comic Book Resources! 12/3/08 A Look at Nova #20's Villain Variant Cover! 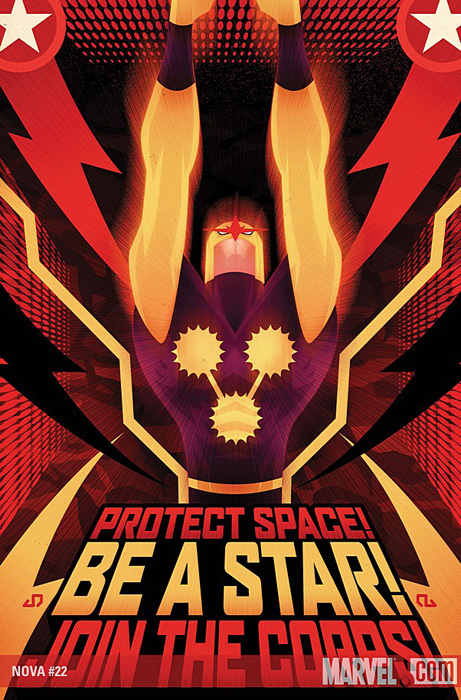 Marvel has released a preview of the villain variant cover for Nova #20! The variant features art by Mike Deodato, Jr.! Nova #20 is on sale December 24th! 11/30/08 New Nova Statue from Kotobukiya! Special Thanks to Lou Romano for the heads-up! 11/25/08 New Cover to Nova #20! Marvel has released a new cover to Nova #20! 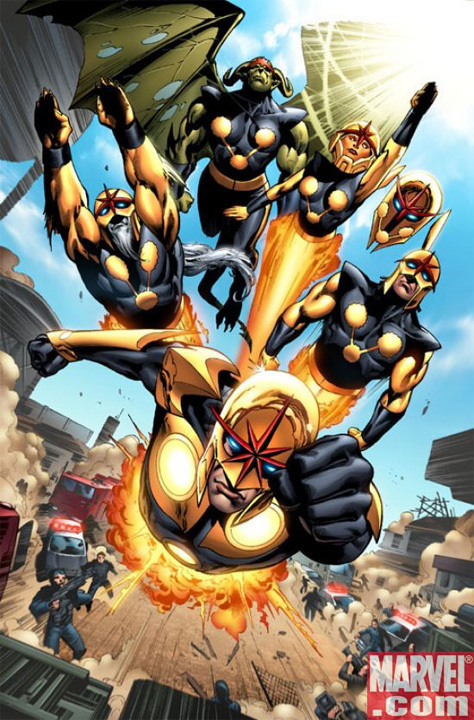 The cover art is by Steve Uy and features the original members of the New Warriors including Nova in his brown costume. Uy's cover replaces the cover originally done by Mike Deodato, Jr.
11/21/08 Five Preview Pages of Nova #19! Marvel has released five preview pages from Nova #19! The issue is written by Dan Abnett and Andy Lanning and art by Wellinton Alves and Scott Hanna. The issue is on sale November 26th! 11/18/08 Nova #18 Sales Ranking / # Sold - Updated! Nova #18 was ranked #71 according to sales numbers released by Diamond Comics Distributors. The estimated number of issues sold was 38,412. Nova #22 - Written by Dan Abnett & Andy Lanning, pencils by Wellinton Alves with cover by Juan Doe. 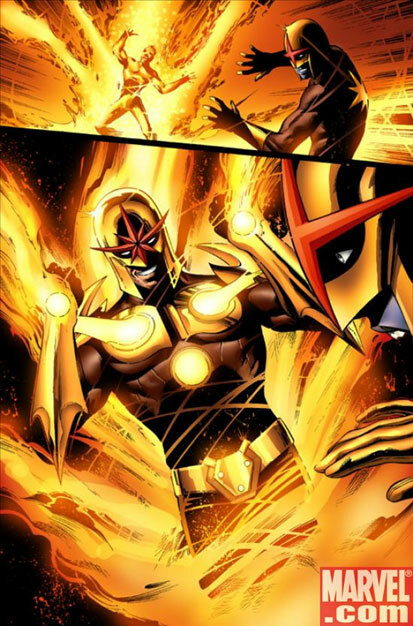 Join the Nova Corps...or suffer the consequences! Worldmind begins the mass transformation of human recruits to fill the ranks of his new Nova Corps--and brands anyone who stands against him a criminal! Richard Rider is powerless to stop the process...but he's going to try anyway, even if it means fighting alone! New characters, razor-sharp plot twists, jaw-dropping cliffhangers...no wonder Aint It Cool News says "NOVA, more than any other series, has me chomping at the bit for the next issue." 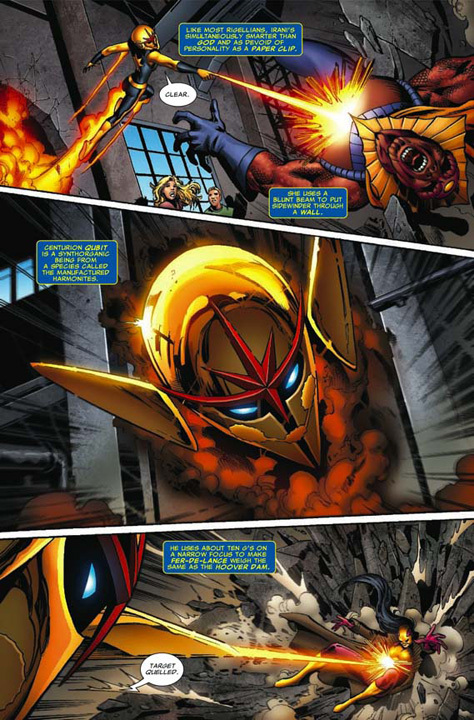 Nova appears in one panel of Iron Man: The End #1. 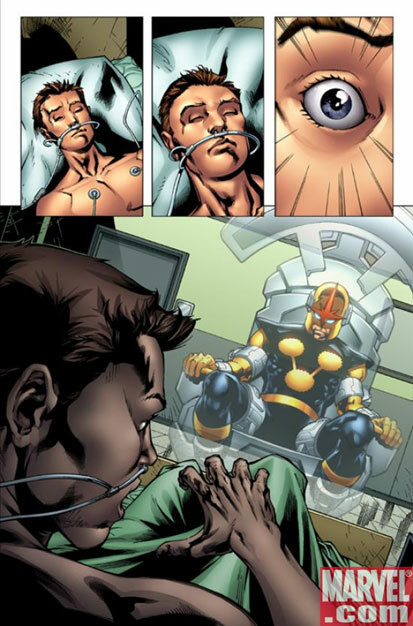 Nova is one of many heroes who appear on Tony Stark's computer monitor. 11/6/08 Five Preview Pages of Nova #19! Also, make sure to check out an interview with DnA at marvel.com! 11/3/08 New Photos of the 2nd Bowen Nova Statue! 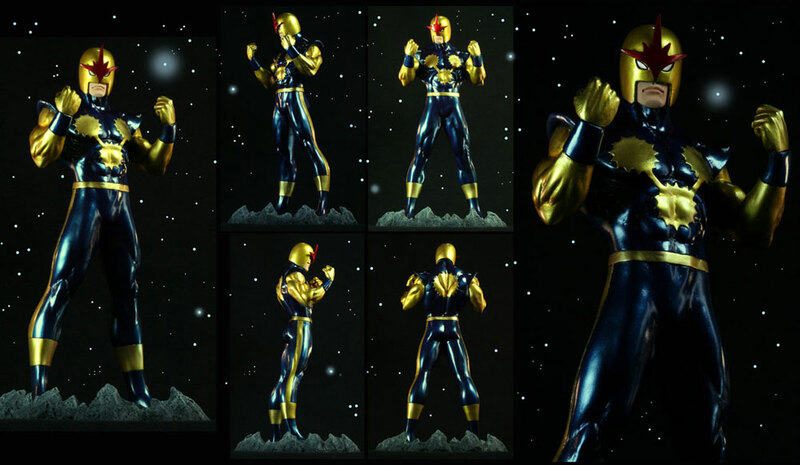 Randy Bowen of Bowen Designs has released updated photos of the second Nova statue based on the current Annihilation uniform! The statue is being sculpted by the Kucharek Brothers. 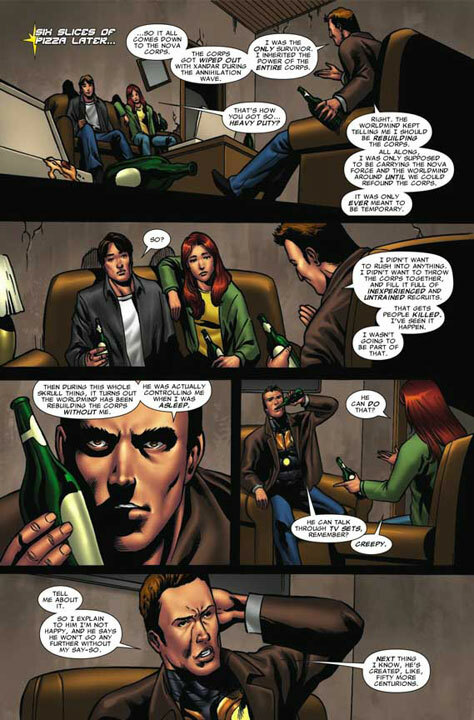 10/24/08 Six Preview Pages of Nova #18! Marvel has released six preview pages from Nova #18! The issue is written by Dan Abnett and Andy Lanning and art by Wellinton Alves, Geraldo Borges and Scott Hanna. The issue is on sale October 29th! Nova #21 - Written by Dan Abnett & Andy Lanning, pencils by Wellinton Alves with cover by Adi Granov. Richard Rider: Nova no more? 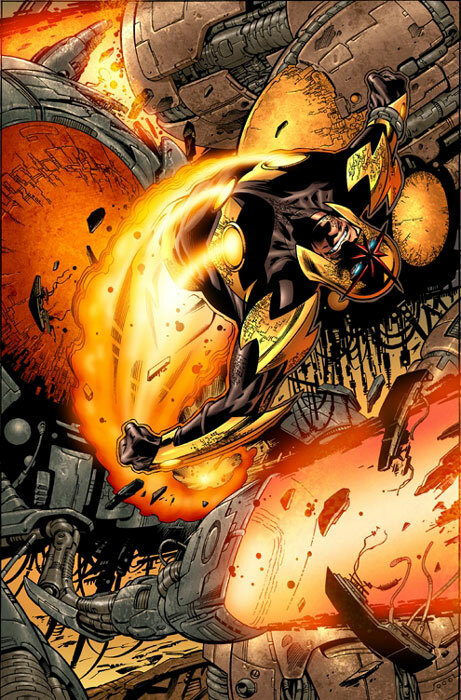 With the new Nova Corps on Earth laying down the law, is there no longer a need for the Human Rocket? Plus: guest-stars Darkhawk and the original Quasar! Dan Abnett, Andy Lanning and Wellinton Alves hit you with the biggest twists yet in the latest jaw-dropping installment of what Wizard calls "the best outer space soap opera since "Star Wars!" 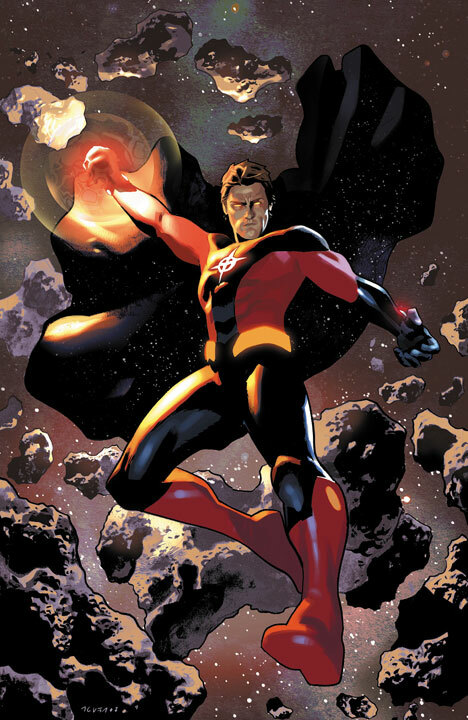 10/21/08 Nova: Origin of Richard Rider #1 Solicitation! Nova: Origin of Richard Rider #1 - Written by Dan Abnett, Andy Lanning and Marv Wolfman, art by John and Sal Buscema with cover by John Buscema. 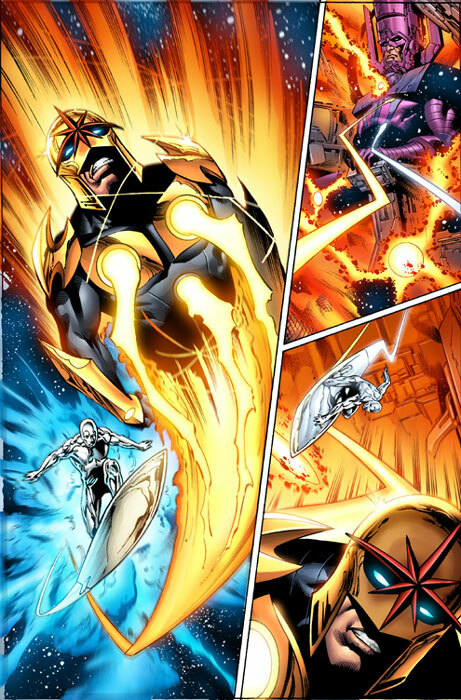 You know Nova from his hit on-going series; now, see how it all began in this power-packed origin! 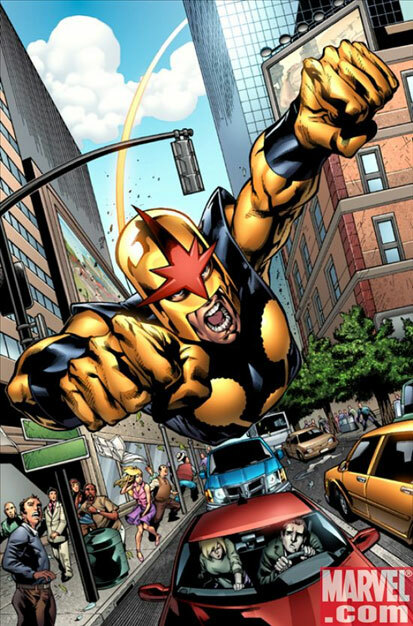 Before NEW WARRIORS and ANNIHILATION, Nova was one of the seventies' most scintillating stars! Experience the birth of Marvel's sci-fi hero like never before with a brand-new framing sequence by fan-favorite NOVA scribes Dan Abnett and Andy Lanning! Re-presenting NOVA #1 and #4. 10/20/08 Nova #17 Sales Ranking / # Sold - Updated! Nova #17 was ranked #61 according to sales numbers released by Diamond Comics Distributors. The estimated number of issues sold was 37,005. 10/10/08 Three Preview Pages of Nova #18! 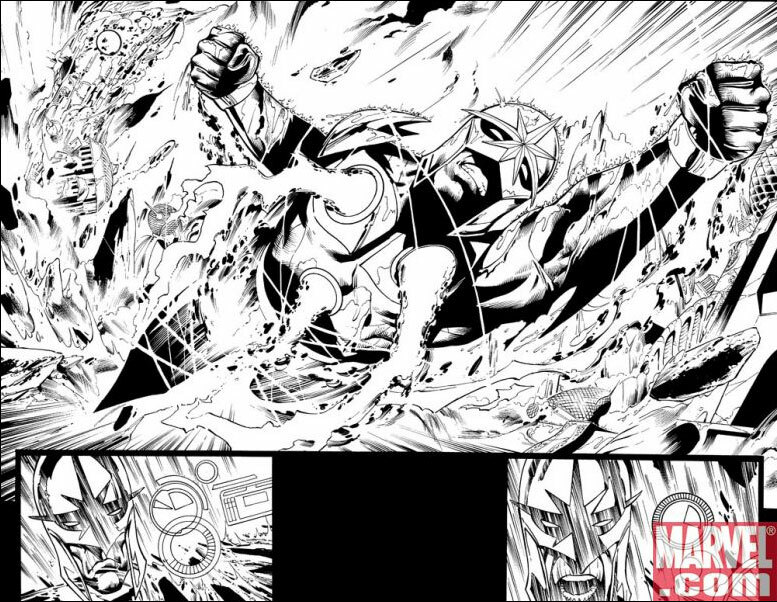 Joe Quesada, on Marvel's My Cup O' Joe column, previewed three inked pages to Nova #18! Nova #18 is on sale October 29th! 10/9/08 New Photos of the 2nd Bowen Nova Statue! 10/8/08 A Look at Nova #18's Two Covers! Nova's editor, Bill Rosemann, has generously shared both covers to Nova #18 (the standard version and the Marvel Zombies retailer incentive variant version) including the Nova logo and credits! 9/29/08 A Look at Nova #18's Zombie Variant Cover! 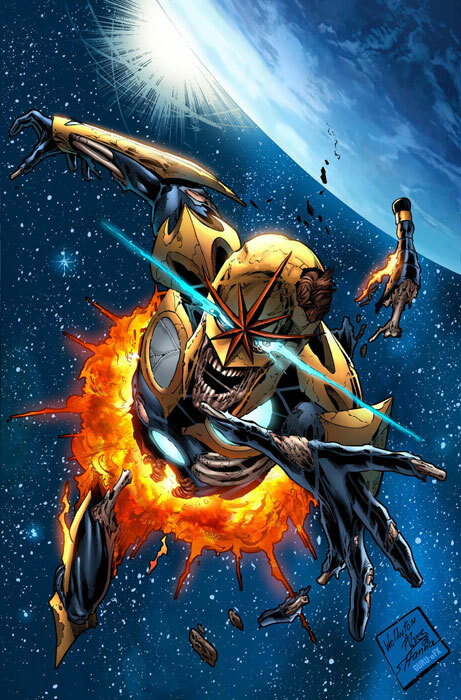 Marvel has released a preview of the Marvel Zombies variant cover for Nova #18! The variant features art by Nova artist Wellinton Alves! 9/26/08 Two Preview Pages of Nova #18! 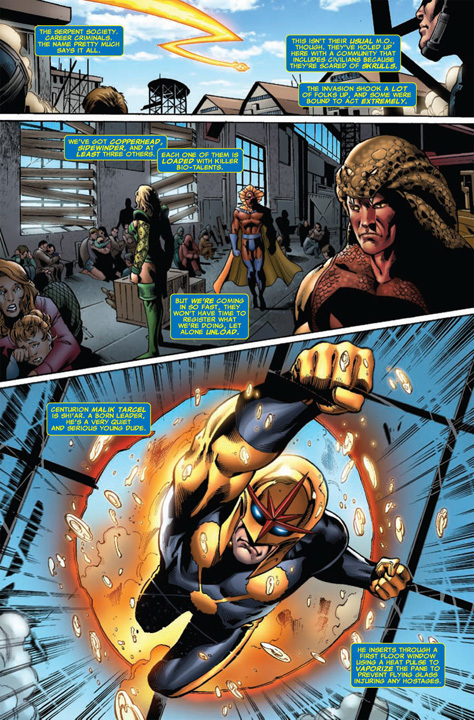 In an Abnett/Lanning interview with Comic Book Resources, Marvel released two preview pages from Nova #18! Courtesy of Comic Book Resources. 9/26/08 Nova Statue Available For Pre-Order! 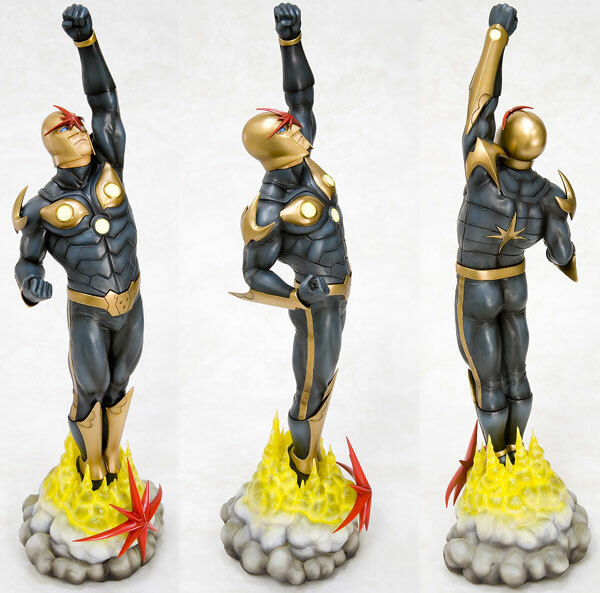 The first of two Nova statues from Bowen Designs is now available for pre-order! The statue features Nova in his classic original uniform. The statue has a price of $170 and was sculpted by the Kucharek Brothers. 9/25/08 Photos of the Second Bowen Nova Statue! 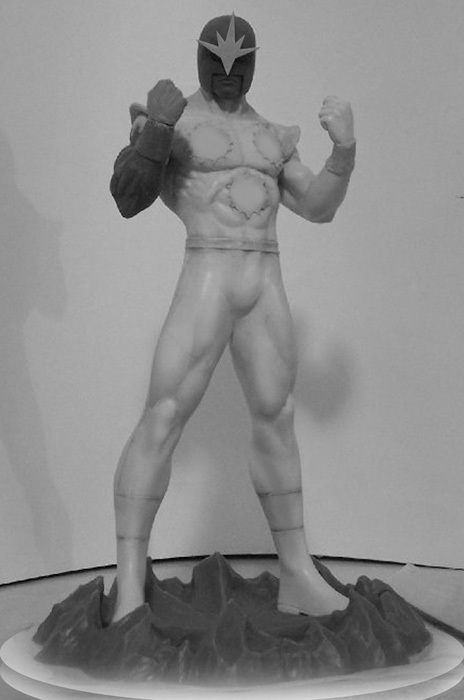 Randy Bowen of Bowen Designs has released photos of a second Nova statue based on the current Annihilation uniform! The statue is being sculpted by the Kucharek Brothers. 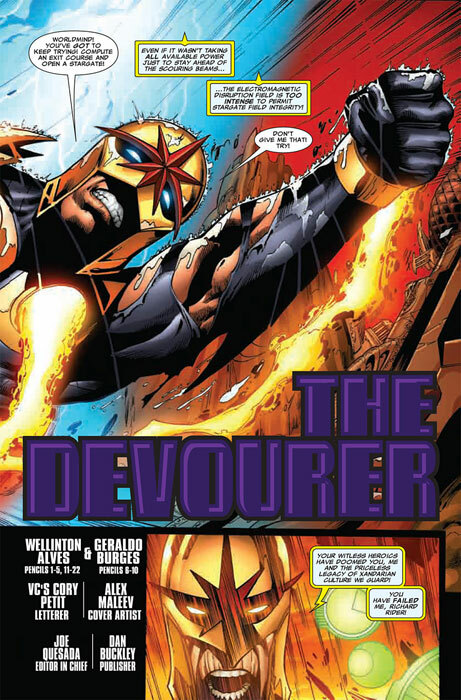 9/24/08 Nova #16 Sales Ranking / # Sold - Updated! Nova #16 was ranked #61 according to sales numbers released by Diamond Comics Distributors. The estimated number of issues sold was 38,338. 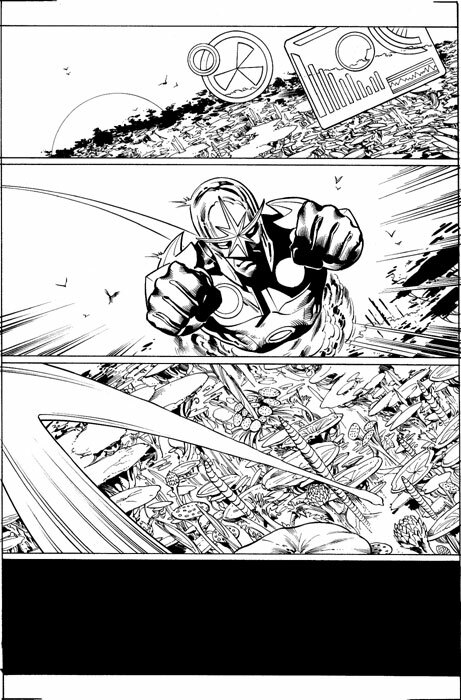 9/19/08 Six Preview Pages of Nova #17! Marvel has released six preview pages from Nova #17! The issue is written by Dan Abnett and Andy Lanning and art by Wellinton Alves and Scott Hanna. The issue is on sale September 24th! 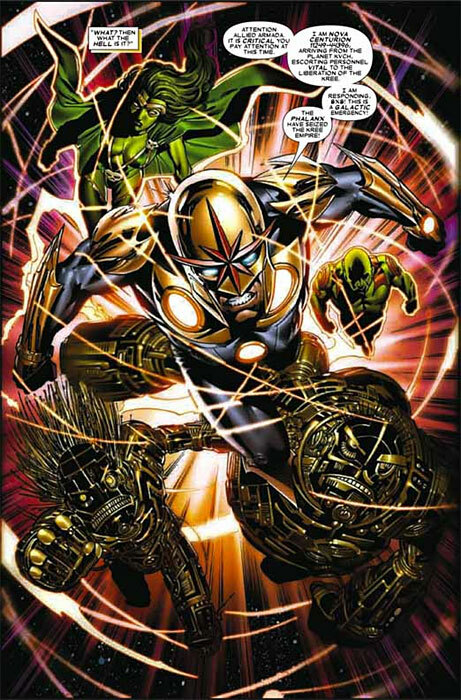 A Nova Skrull based on the current Nova (along with Drax, Moondragon and Comet Man) has an appearance in Iron Man: Director of SHIELD #33. 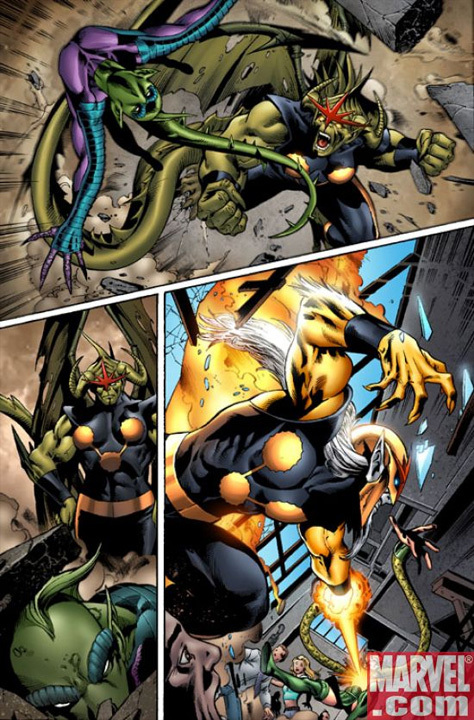 He is one of a number of Skrulls attacking Earth in the Secret Invasion mini-series. Special thanks to David Macnab for the heads-up! 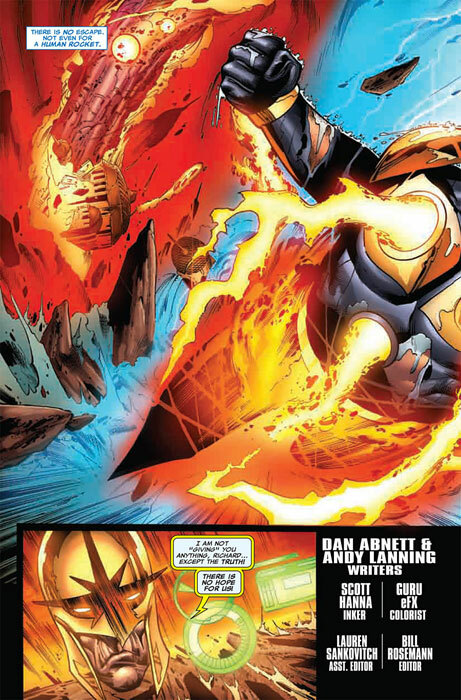 Nova #20 - Written by Dan Abnett & Andy Lanning, pencils by Wellinton Alves with cover by Mike Deodato, Jr.
Guest-starring the original New Warriors...and the Nova Corps?! 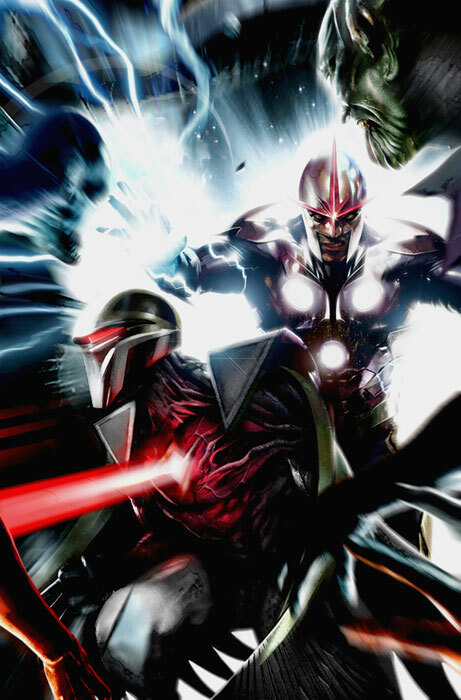 Whether Rich Rider likes it or not, the Nova Corps has been re-founded, and planet Earth doesn't seem ready for its futuristic policing methods! Now the Human Rocket is on a collision course with some of his oldest friends and ex-teammates... the original New Warriors! Plus: a sucker punch ending that will make you gasp "I don't believe they did that!" It's all in the next issue of the book that has Aint It Cool News raving "This is now Marvel's benchmark comic." Rated T+ ...$2.99 - On Sale December 24th - Special Note: Nova #20 will also have a Villains Variant cover available! 9/16/08 Nova Vol. #1 Hardcover in December! 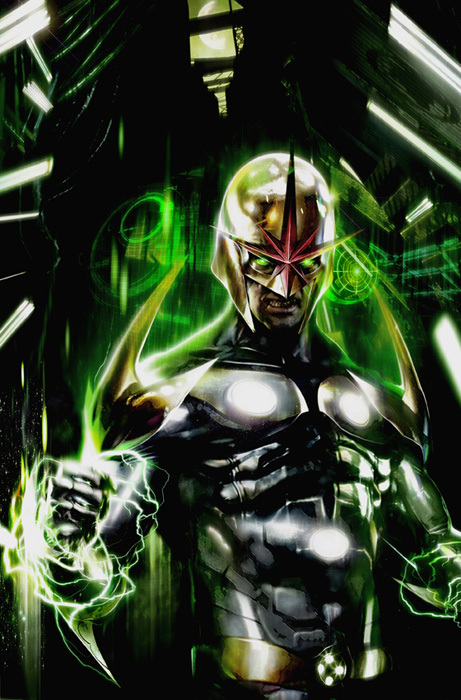 Marvel will be releasing a hardcover edition of Nova in December! The book will collect Nova 1 - 12 plus Nova Annual #1! It goes on sale December 10th and costs $34.99. 9/3/08 Four Preview Pages of Nova #17! Marvel has released four preview pages from Nova #17! The issue is written by Dan Abnett and Andy Lanning and art by Wellinton Alves and Scott Hanna. The issue is on sale September 24th! 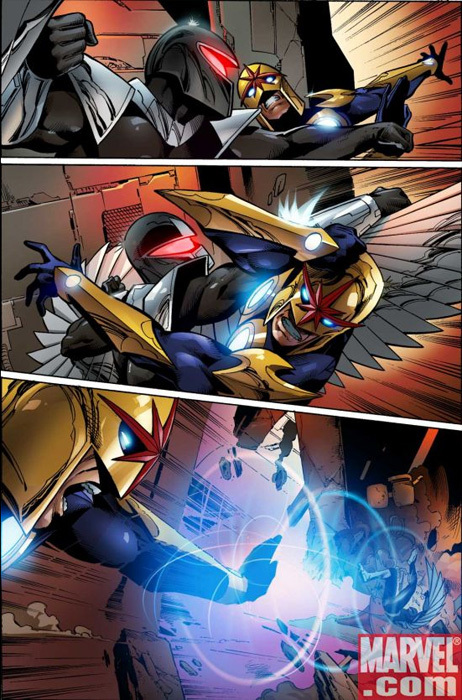 Marvel.com also has an interview with Dan Abnett about the upcoming team-up between Nova and Darkhawk! 9/3/08 A Look at Nova #17's Cover! Nova's editor, Bill Rosemann, has generously shared the cover to Nova #17 including the Nova logo and credits! Nova #17 is on sale September 24th! 9/1/08 Photos of the painted Bowen Nova Statue! 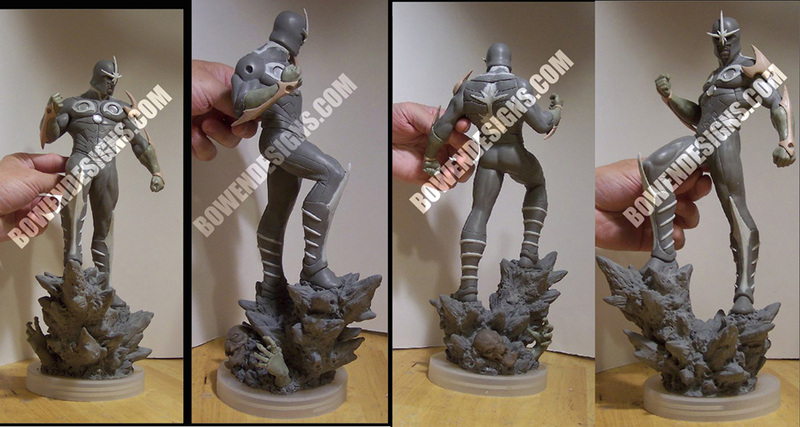 Randy Bowen of Bowen Designs has released photos of one of the painted Nova statues! The statue should be available sometime in 2009! 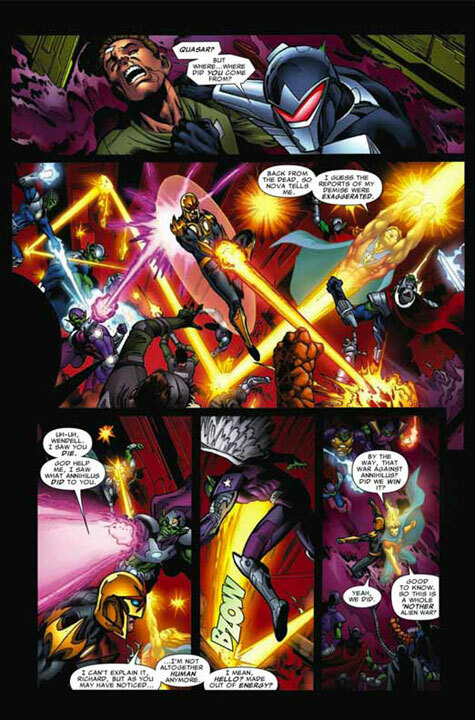 A Nova Skrull has an appearance in New Warriors #15. 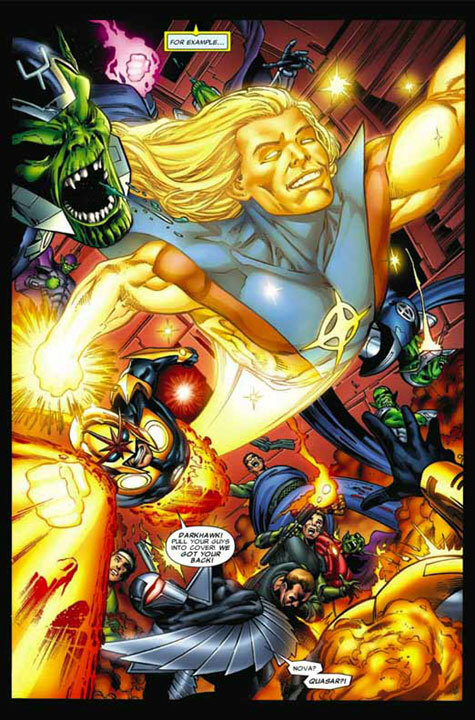 He is one of a number of Skrulls attacking Earth in the Secret Invasion mini-series. 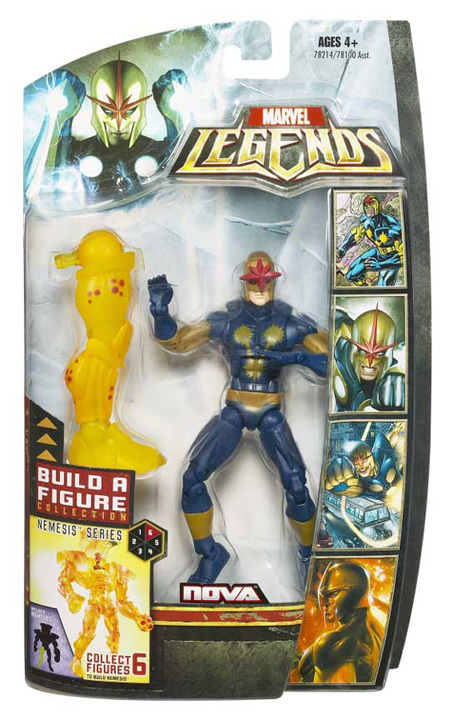 The Marvel Legends Nova action figure will now be available as a Wal-Mart Exclusive in December with a price tag of $9.99. The folks at Action-Figure took a photo of the figure at San Diego ComicCon 2008. 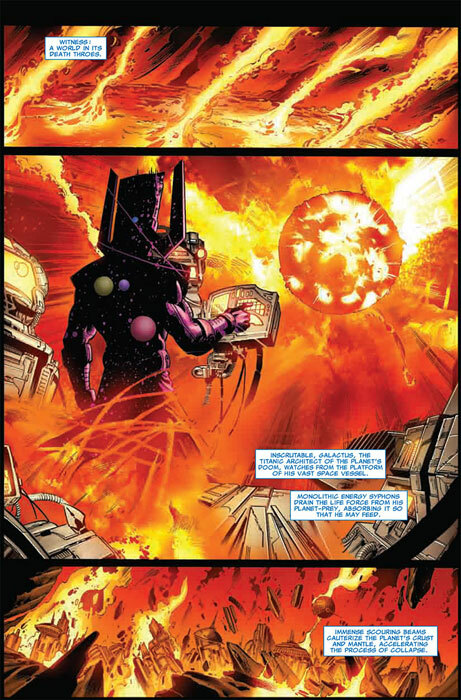 Nova and the events of both Annihilation and Annihilation: Conquest are featured in Marvel: Your Universe. It's a 32-page comic which gives an overview of events from the last five years of Marvel Comics. The issue is free and available at local comic shops everywhere. 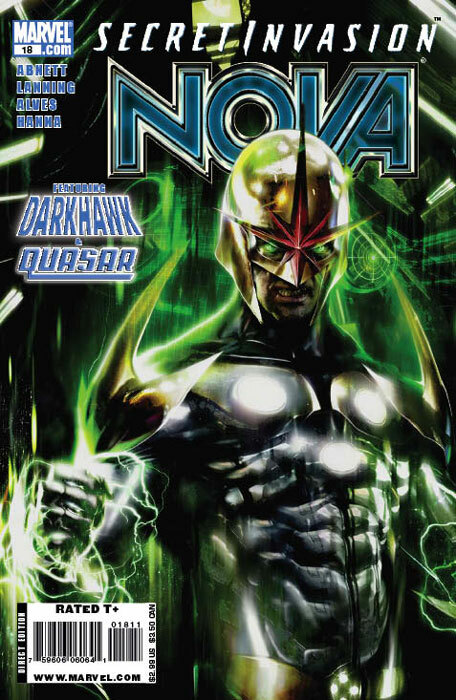 8/25/08 Nova #15 Sales Ranking and Number Sold! Nova #15 was ranked #93 according to sales numbers released by Diamond Comics Distributors. The estimated number of issues sold was 28,592. 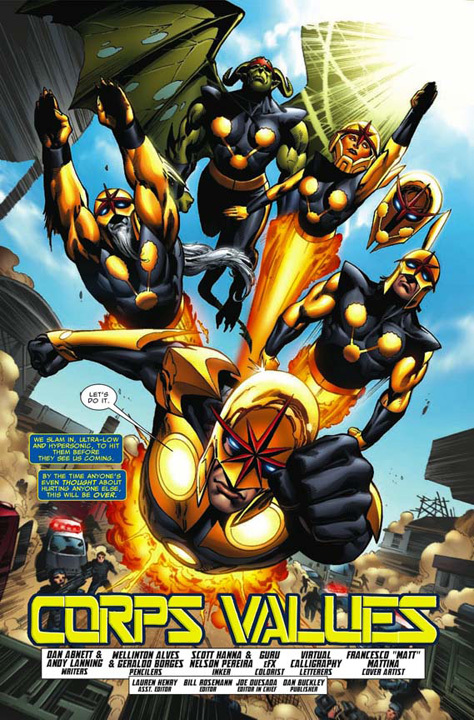 8/22/08 New Nova #17 Cover and 2 Preview Pages! 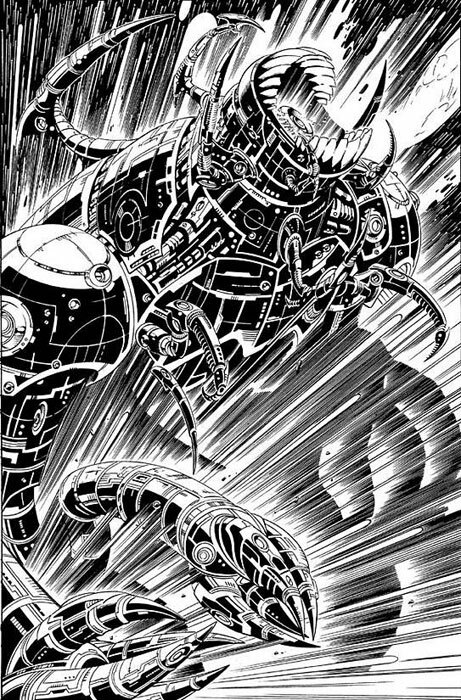 Joe Quesada, on Marvel's My Cup O' Joe column, previewed a NEW cover to Nova #17 along with two inked pages to the issue! Nova #17 is on sale September 24th! 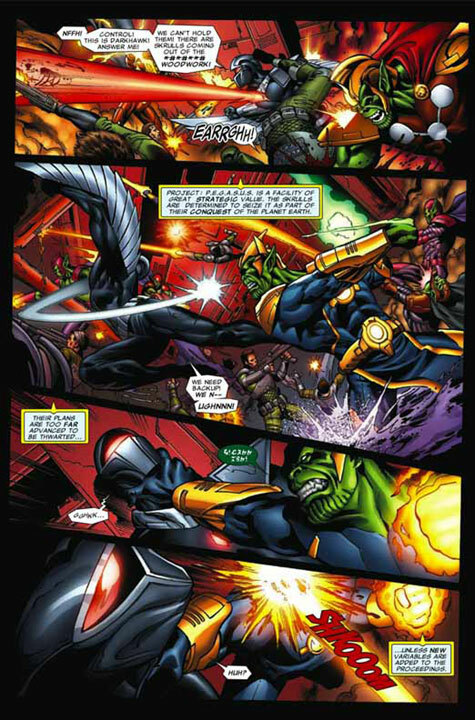 8/22/08 Six Preview Pages of Nova #16! Marvel has released six preview pages from Nova #16! The issue is written by Dan Abnett and Andy Lanning and art by Wellinton Alves, Geraldo Burges and Scott Hanna. The issue is on sale August 27th! Nova #19 - Written by Dan Abnett & Andy Lanning, pencils by Wellinton Alves with cover by Francesco Mattina. 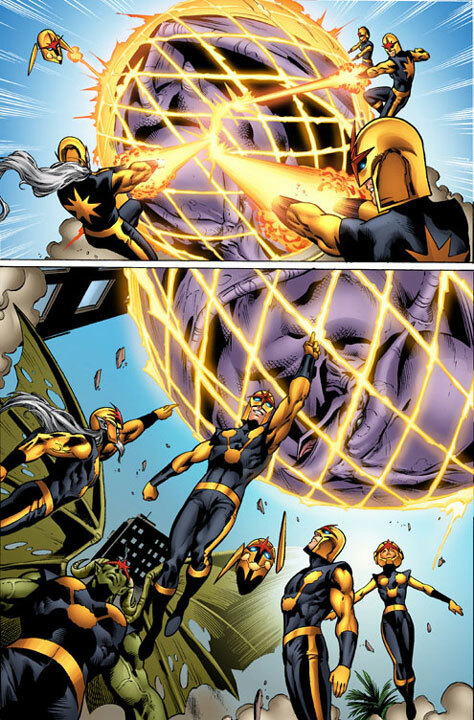 Could it be...the return of the Nova Corps? After last issue's jaw-dropping cliff-hanger, will things ever be the same for Richard Rider? 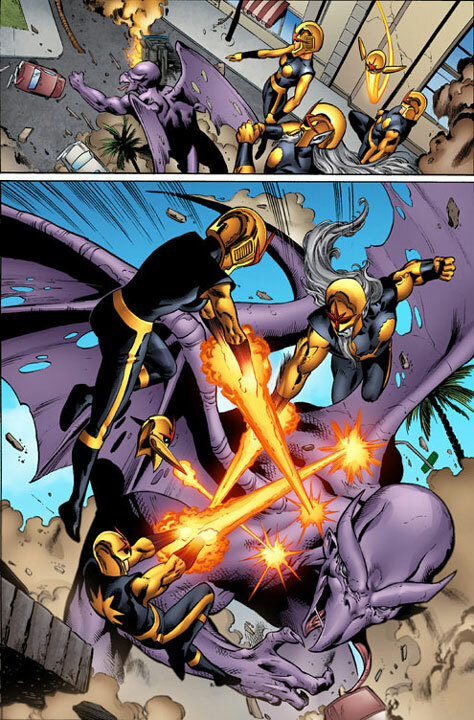 What is the Worldmind up to, and what will it mean for the future of the Human Rocket and the Nova Corps itself?! Cosmic fans will not want to miss this status-quo-changing chapter of the series Ain't It Cool News calls "Brilliant. Just brilliant." 8/18/08 Variant Cover for Nova #18! Along with the Francesco Mattina cover for the standard edition of Nova #18, Marvel will release a Marvel Zombies variant cover by Wellinton Alves! 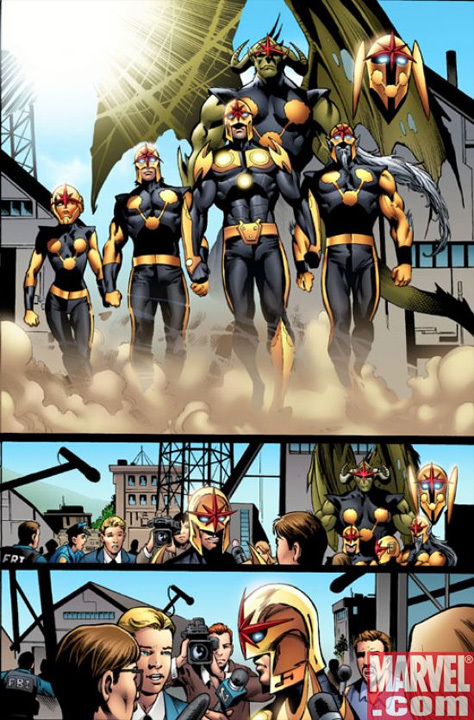 The Nova Skrull has an appearance in issue #2 of the Runaways/Young Avengers mini-series. 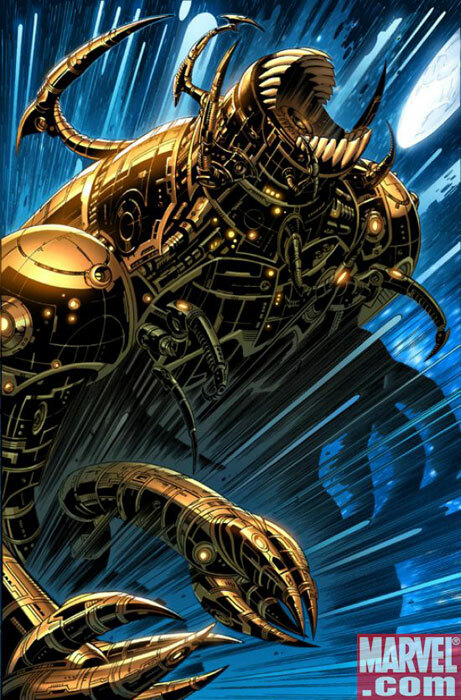 He is one of a number of Skrulls attacking Earth in the Secret Invasion mini-series. Special thanks to timelord4912 for the info! 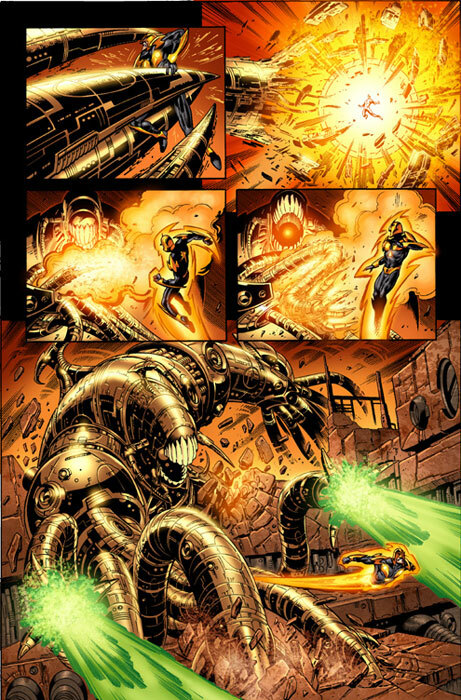 A super-powered female Skrull posing as a Nova Centurion appears in Secret Invasion: Frontline #2. 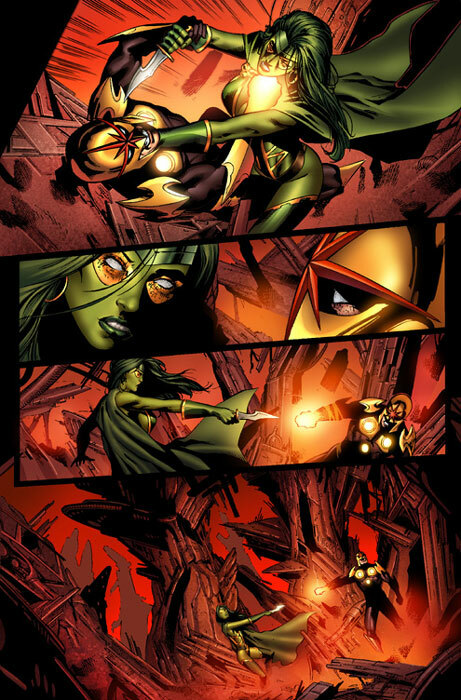 She is one of a number of Skrulls attacking Earth in the Secret Invasion mini-series. Special thanks to Tom Brennan for the info! 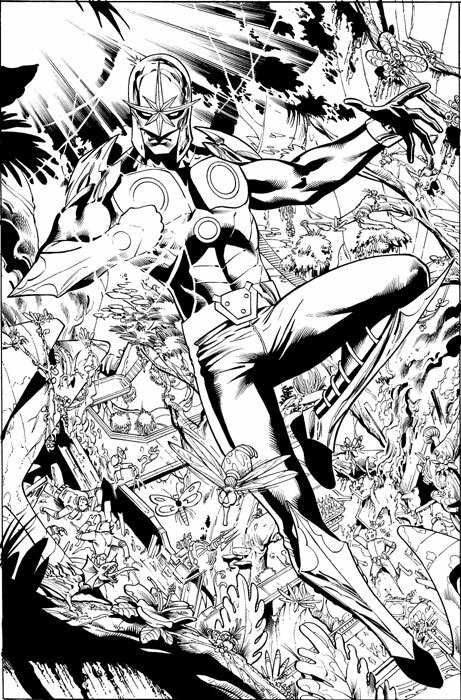 8/1/08 Pages of Nova #16 & Cover to Nova #19! Nova editor, Bill Rosemann, filled in for Joe Quesada on Marvel's My Cup O' Joe column. 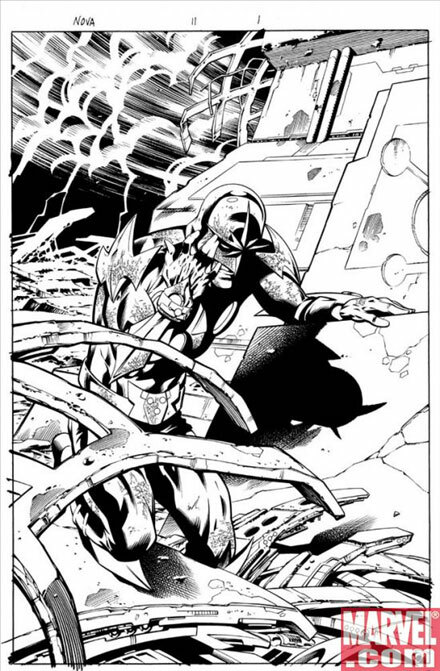 Bill previewed the cover to Nova #19 along with four inked pages to Nova #16! Nova #16 is on sale August 27th! 7/30/08 Nova Minimate Available in October! Diamond Select Toys will be releasing their Nova Minimate figure in October! The minimate can be pre-ordered in the Aug. 2008 Previews catalog! 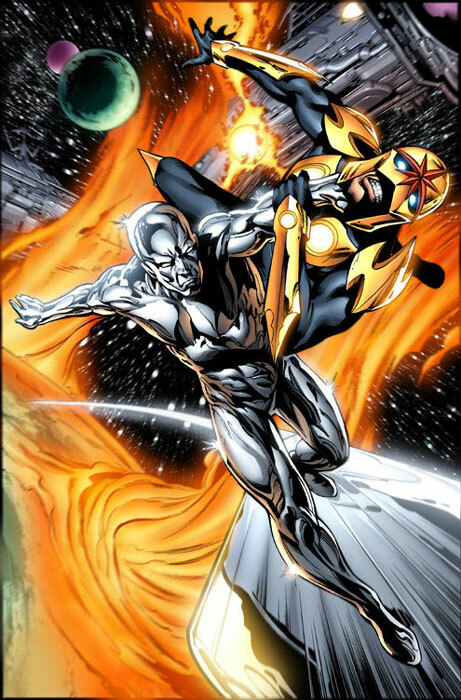 Nova is part of Series 23 along with Gamora, Cloak & Dagger, two War Machines and Spymaster. The set costs $7.99. 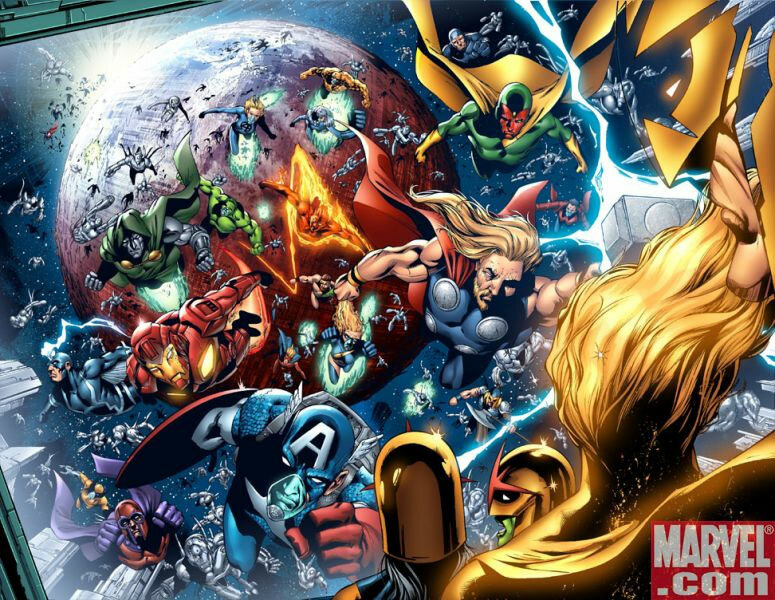 At San Diego Comic Con, Marvel announced their next cosmic event called 'War of Kings'. 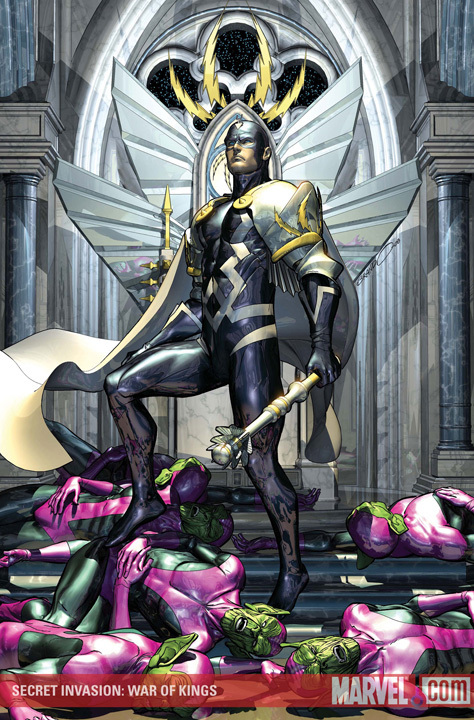 The storyline will involve the former X-Men and current emperor of the Shi'Ar Empire, Vulcan. 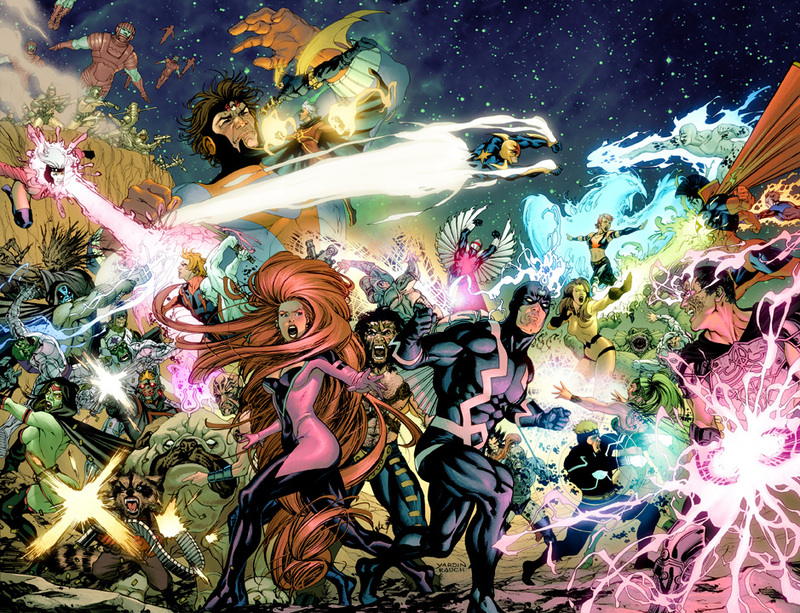 Other characters to get involved are the Inhumans and the Starjammers. 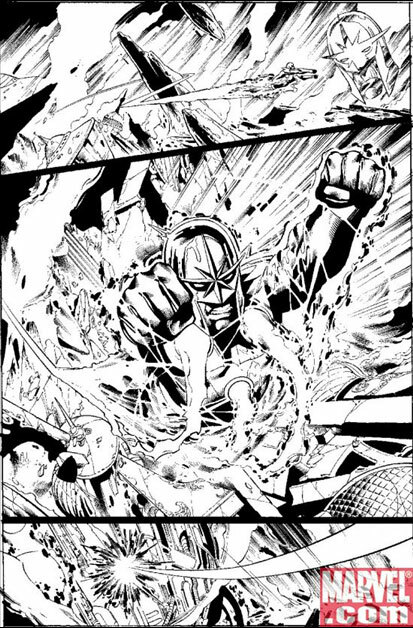 When asked how 'War of Kings' will affect Nova, Nova's co-writer Andy Lanning replied "Here's a rock, here's a hard place â€” now choose." The 'War of Kings' will run through the remainder of 2008 and into 2009 and will be written by Dan Abnett and Andy Lanning. 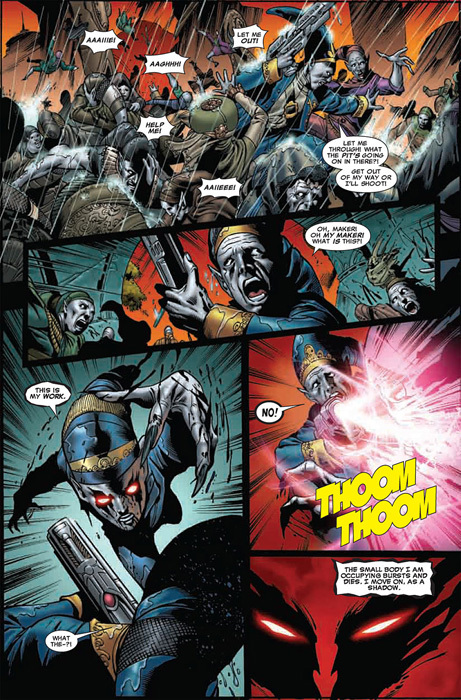 Former Nova Corpsman Muraitak Grot appears in an entry in the Secret Invasion: Skrulls handbook. 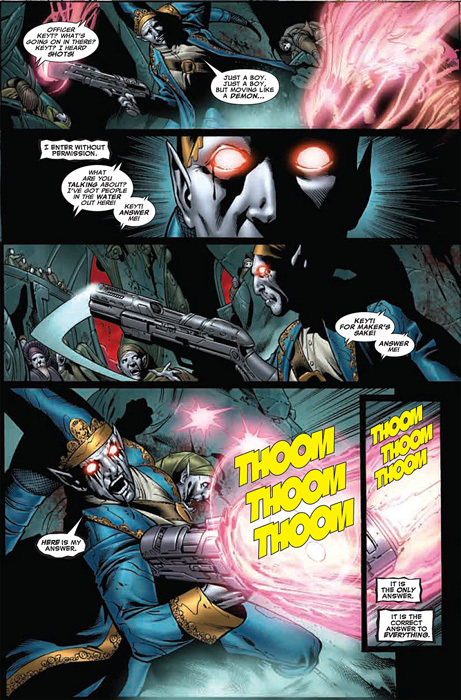 The issue also has multiple references to the Skrull/Xandar War including Skrull X, Emperor Dorrek VII and Empress R'Klll. Nova #18 - Written by Dan Abnett and Andy Lanning, pencils by Wellinton Alves with cover by Francesco Mattina. 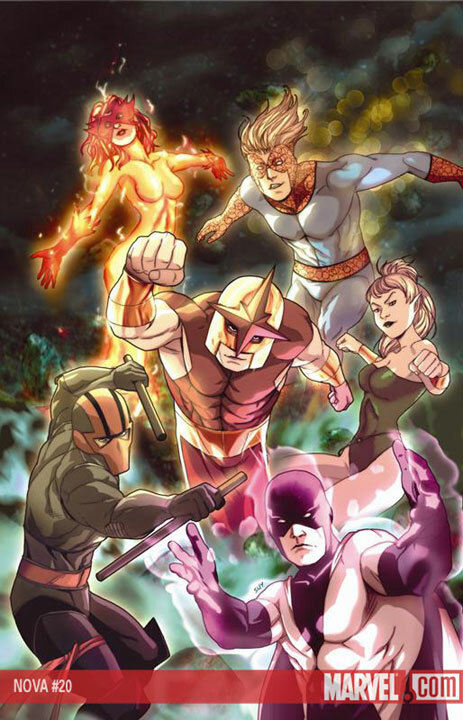 The Skrulls are assaulting Project Pegasus, and only Nova - and a roster of unexpected allies - stands in their way. But whatever happens, Richard Rider's life will be changed forever! Human Rocket fans must not miss this essential issue, in which you'll find out why Wizard says "Abnett and Lanning make space the final frontier of awesomeness!" 7/21/08 Nova #14 Sales Ranking and Number Sold! Nova #14 was ranked #76 according to sales numbers released by Diamond Comics Distributors. The estimated number of issues sold was 28,881. 7/16/08 Photo of the Bowen Nova Statue! 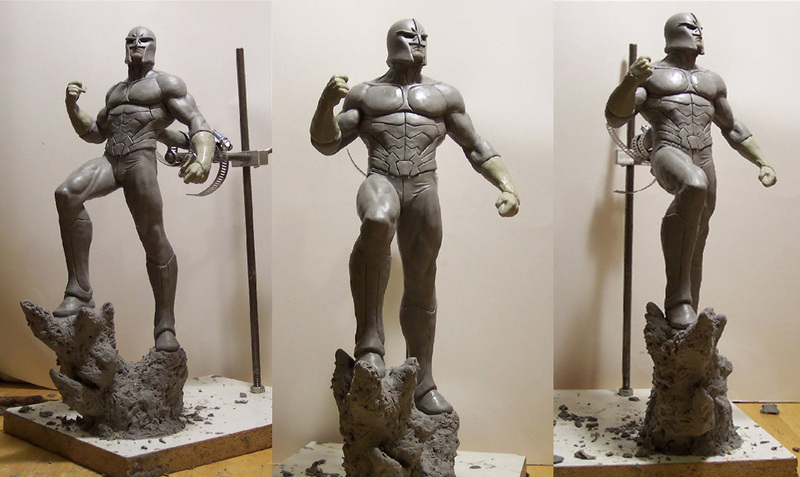 Randy Bowen of Bowen Designs has released a work-in-progress photo of one of the Nova statues! 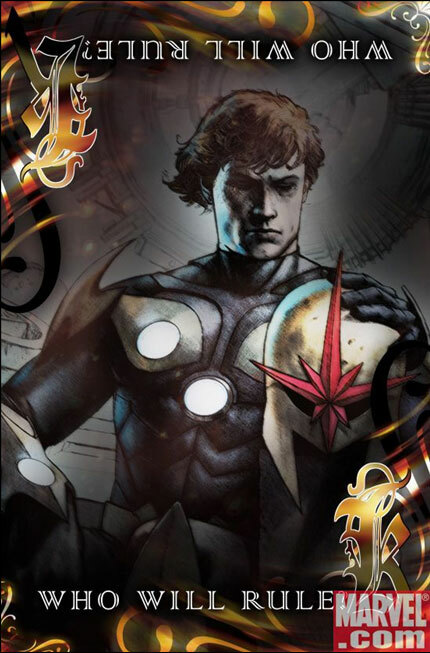 Nova appears on card #59 in the new Marvel Masterpieces Set 2 trading card set. He also appears in one of the exclusive sketch cards done by Nova cover artist Alex Maleev (pictured left). The question was: "Do you think Rich's parents are Skrulls?" 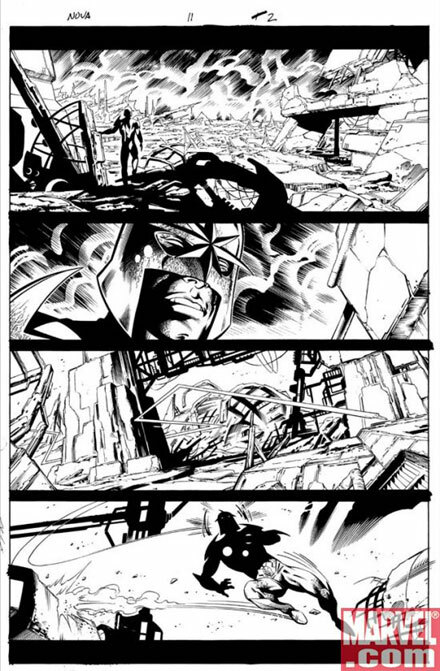 7/4/08 Six Preview Pages of Nova #15! 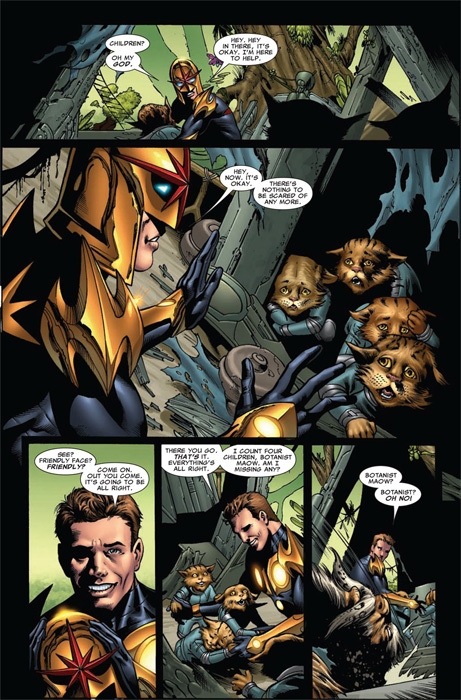 Marvel has released six preview pages from Nova #15! 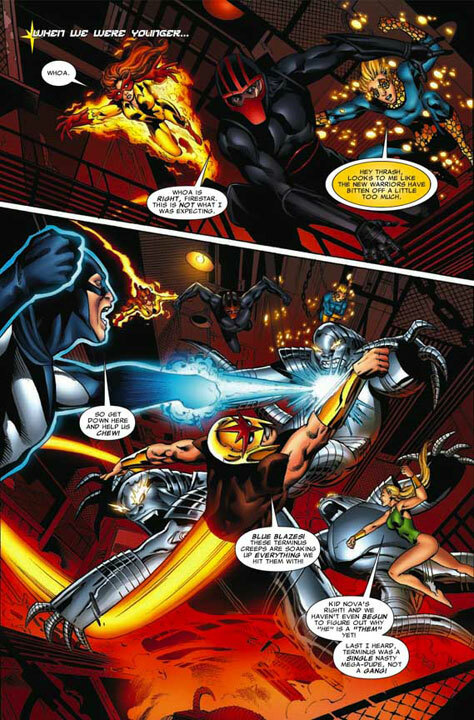 The issue is written by Dan Abnett and Andy Lanning and art by Wellinton Alves, Geraldo Burges and Scott Hanna. The issue is on sale July 9th! 6/30/08 Four Preview Pages of Nova #16! 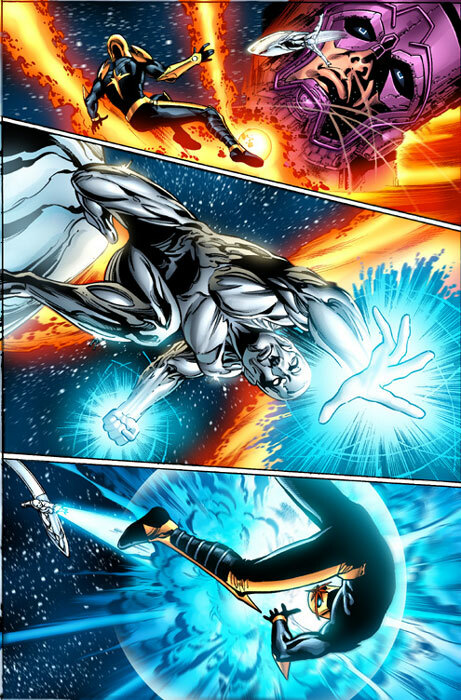 Nova editor, Bill Rosemann, has provided four preview pages from Nova #16! The issue is written by Dan Abnett and Andy Lanning and art by Wellinton Alves and Scott Hanna. The issue is on sale August 27th! 6/27/08 Preview of Nova #18's Cover! At Wizard World Chicago, Marvel released a preview of the cover to Nova #18! Nova #18 is on sale in October! 6/23/08 A Look at Nova #15! 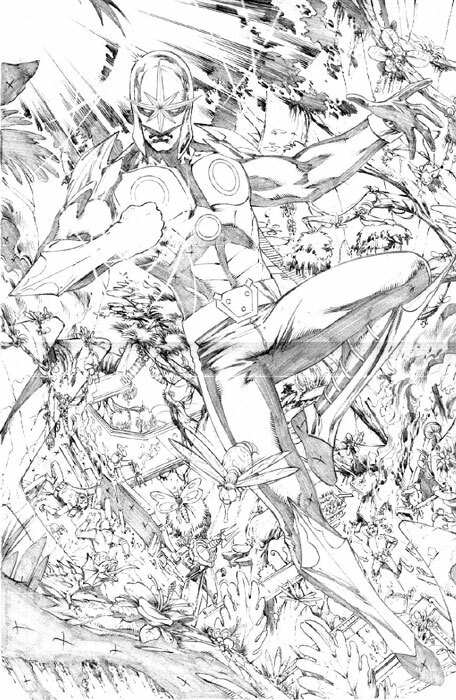 Nova's editor, Bill Rosemann, has generously shared the cover to Nova #15 including the Nova logo and credits! Nova #15 is on sale July 9th! The M2 Nova (from the Spider-Girl universe) appears on a viewscreen in American Dream #4! Special Thanks to timelord4912 for the heads-up!! Nova #17 - Written by Dan Abnett and Andy Lanning, pencils by Wellinton Alves with cover by Paul Davidson. Back on Earth in the middle of the biggest and most insidious alien invasion ever, Richard Rider battles to safeguard the only people he can trust... his family! Rich's kid brother now works at the famous Project Pegasus... and that means he's right in the Skrulls' firing line! It's blistering cosmic-powered action as the last Nova Centurion stands against an entire Skrull strike force hell-bent on securing Project Pegasus's secret weapons for themselves! 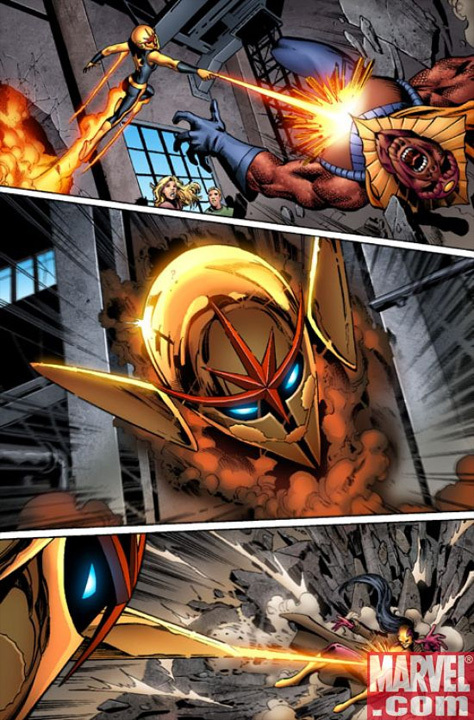 And take it from us, the last page shocker will knock Nova upside his helmet! 6/18/08 Five Preview Pages of Nova #15! Marvel has released five preview pages from Nova #15! The issue is written by Dan Abnett and Andy Lanning and art by Wellinton Alves and Scott Hanna. The issue is on sale July 9th! 6/16/08 Nova #13 Sales Ranking and Number Sold! Nova #13 was ranked #82 according to sales numbers released by Diamond Comics Distributors. The estimated number of issues sold was 30,906. 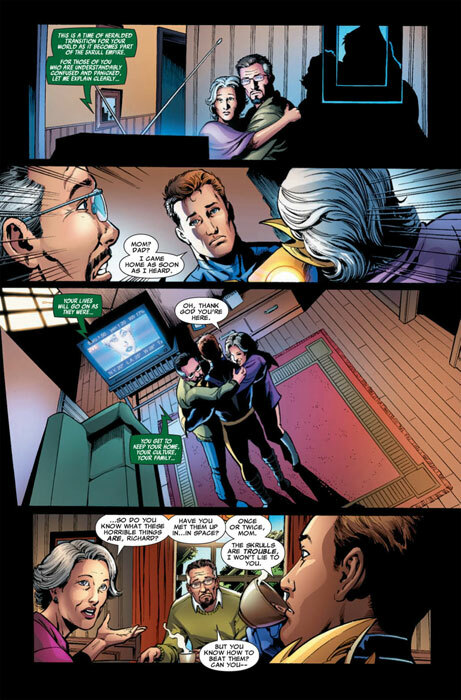 Nova appears as a cartoon character on a television monitor in Newuniversal: Shockfront #2! Special Thanks to Jojo Blomquist and David Macnab for the heads-up!! Nova appears in ToyFare #132 as an action figure in a photo story called 'Just Say Nova' Part 2. The Nova and Nova Spider-Man action figures meet up with the Hulk figure! The magazine also has an article on how to make a custom Nova costume for an action figure! 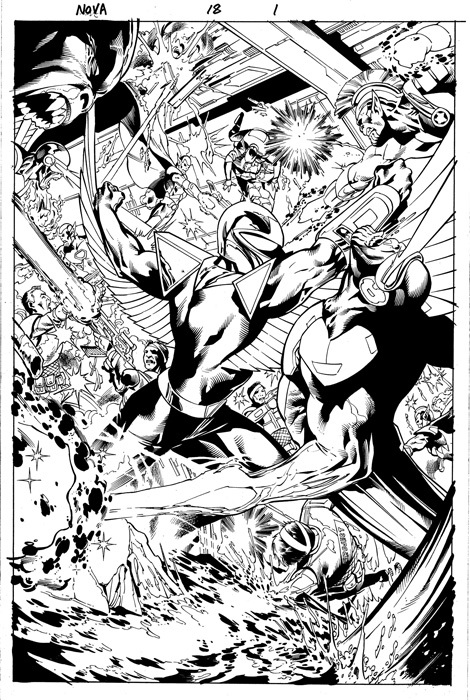 6/7/08 Preview of Nova #17's Cover! 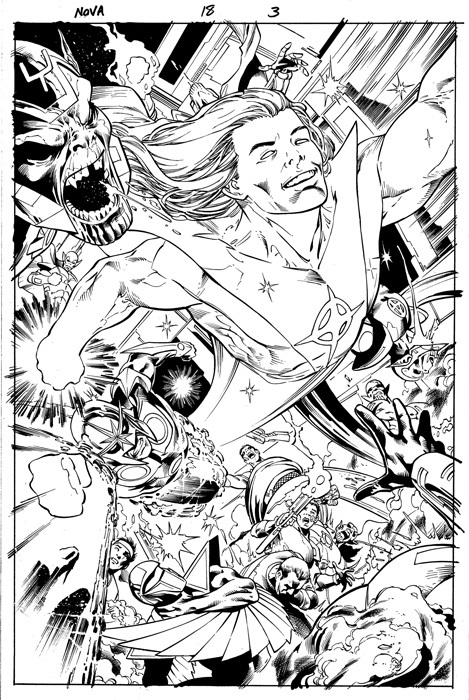 On Joe Quesada's MyCup O' Joe on MySpace, Marvel's Editor-In-Chief released a look at the cover to Nova #17! The issue is written by Dan Abnett and Andy Lanning and art by Wellinton Alves and Scott Hanna. 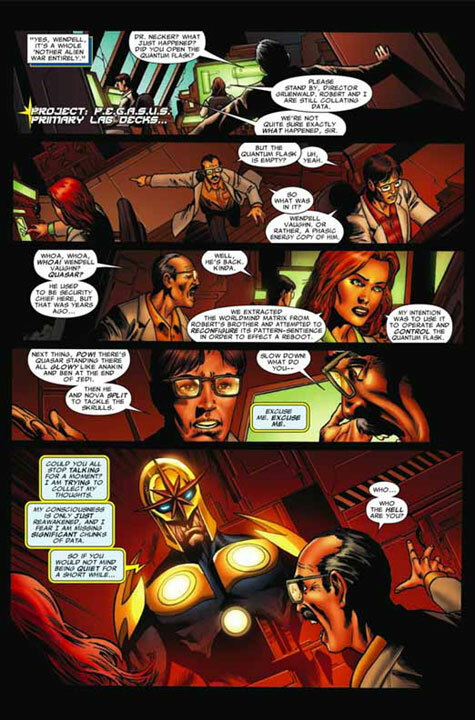 Nova Skrull has a one-panel appearance at the end of Secret Invasion #3! 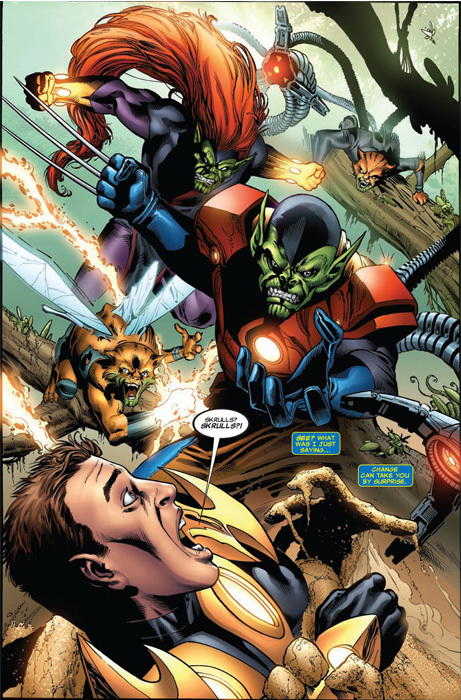 He appears as part of a group of super-powered Skrulls invading Earth. 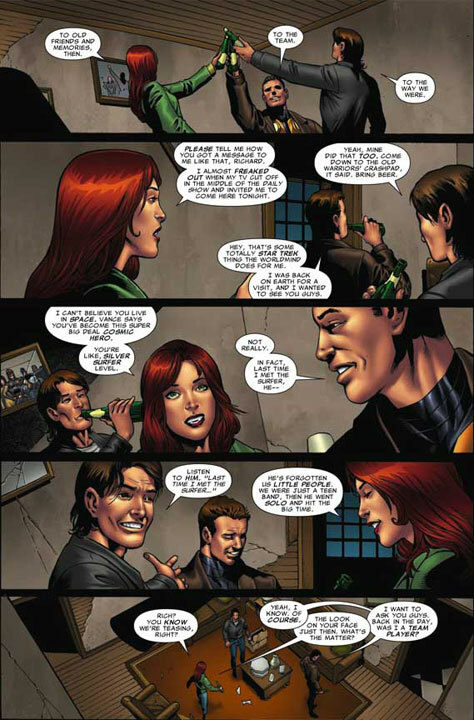 5/30/08 Six Preview Pages of Nova #14! Marvel has released six preview pages from Nova #14! The issue is written by Dan Abnett and Andy Lanning and art by Wellinton Alves and Scott Hanna. The issue is on sale June 4th! Nova appears in ToyFare #131 as an action figure in a photo story called 'Just Say Nova'. The Nova action figure tries to convince the Spider-Man action figure to join the Nova Corps! The magazine also has an article on how to make a custom Nova helmet for an action figure! Special Thanks to Jojo Blomquist and Tom Brennan for the heads-up!! 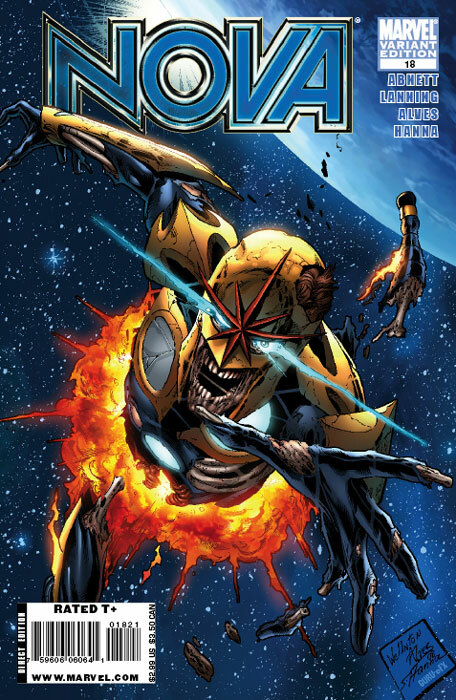 Nova #16 - Written by Dan Abnett and Andy Lanning, pencils by Wellinton Alves with cover by Paul Davidson. At last - our #1 sci-fi hero rockets into the alien invasion saga that's tearing apart the Marvel Universe! But is our always-outnumbered space cop actually teaming with one of the enemy? 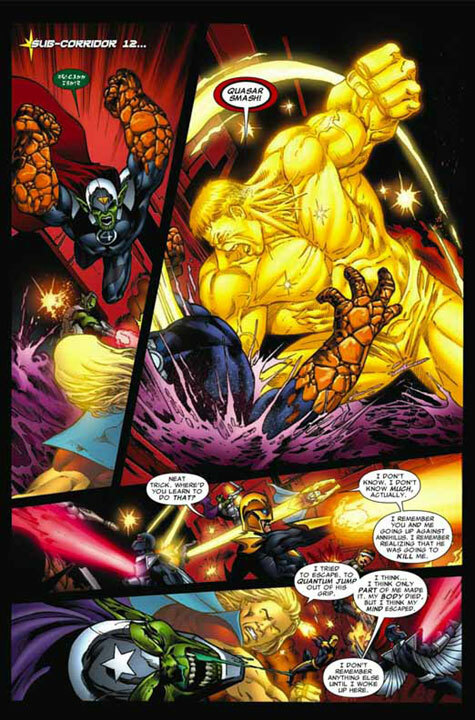 When Super-Skrull comes asking for a favor, can you ever trust the warrior whose life was dedicated to destroying us? The summer blockbuster hits here in the book that IGN calls "easily one of Marvel's best titles"! 5/19/08 Nova #12 Sales Ranking and Number Sold! Nova #12 was ranked #79 according to sales numbers released by Diamond Comics Distributors. The estimated number of issues sold was 29,627. The question was: "Do you want to see the Nova Force explained?" Nova has a small flashback appearance in The Last Defenders #3! Special Thanks to Ron Peck and Max Franks for the heads-up!! 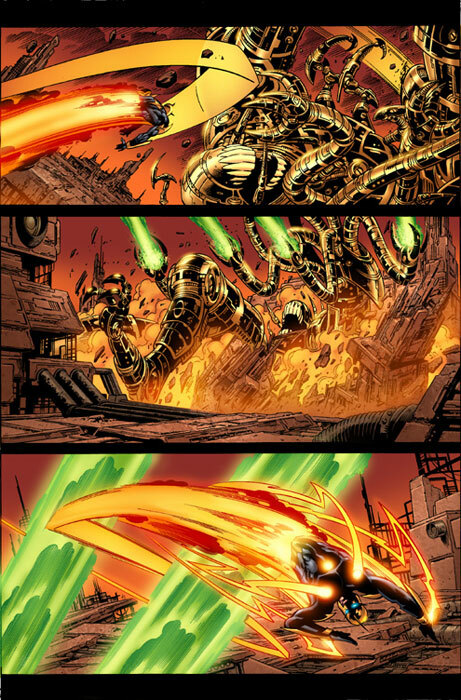 5/10/08 Colored Previews of Nova #14 & #16's Cover! 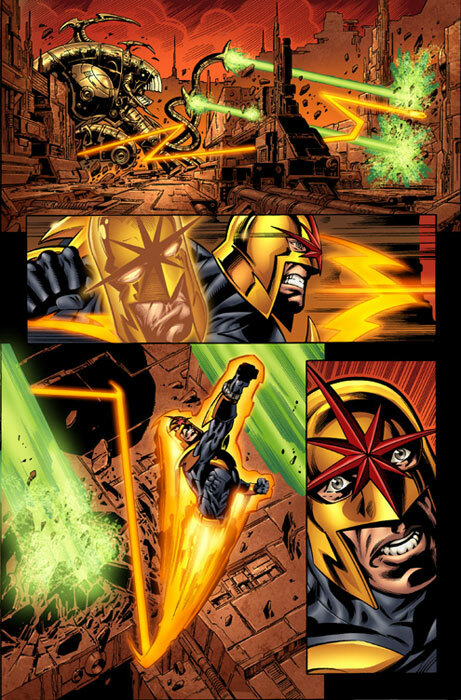 On Joe Quesada's MyCup O' Joe on MySpace, Marvel's Editor-In-Chief released colored preview pages of art from Nova #14! He also showed the cover to Nova #16! 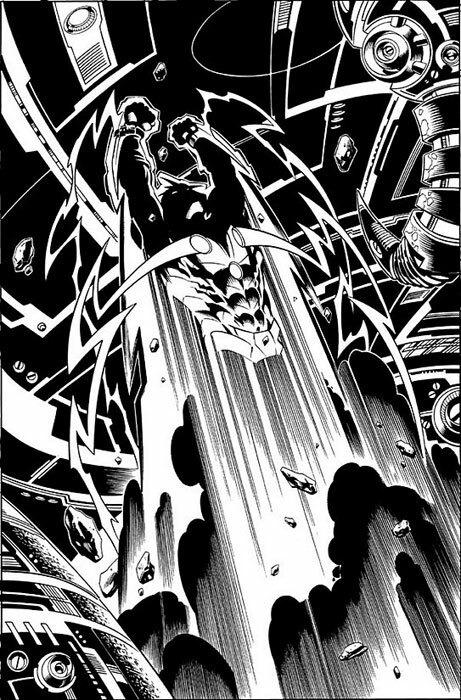 The issues are written by Dan Abnett and Andy Lanning and art by Wellinton Alves and Scott Hanna. 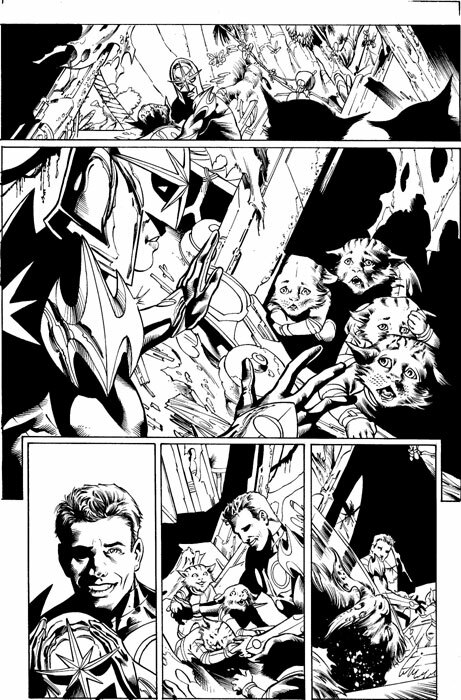 5/9/08 Preview Page of Guardians of the Galaxy #1! 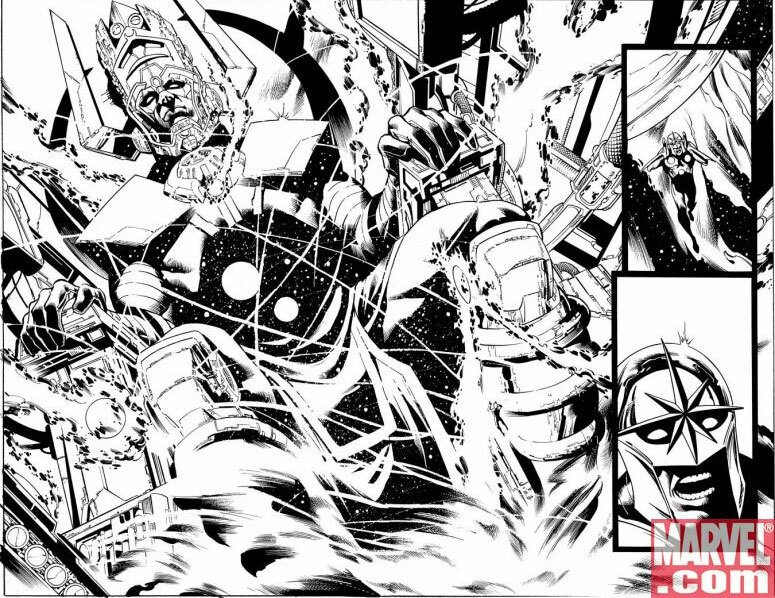 Marvel has released preview pages of art from Guardians of the Galaxy #1! 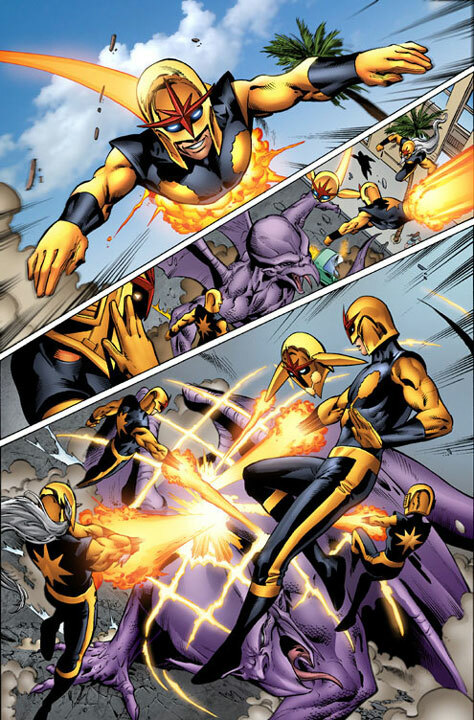 Below is a page featuring Nova. 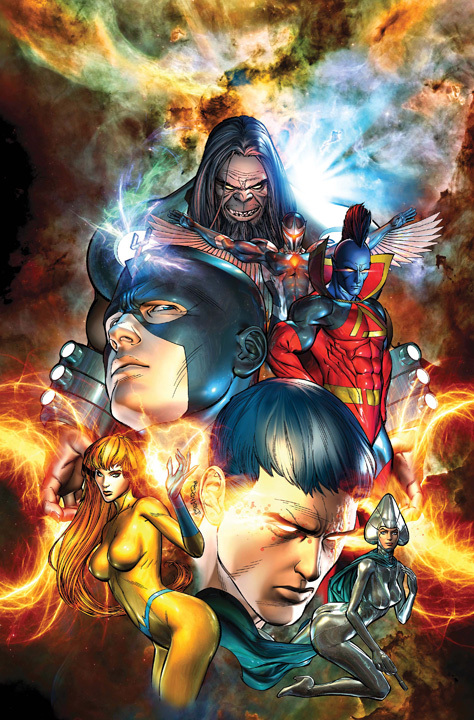 The issue is written by Dan Abnett and Andy Lanning and art by Paul Pelletier. It's on sale May 14th! Reserve your copy today! 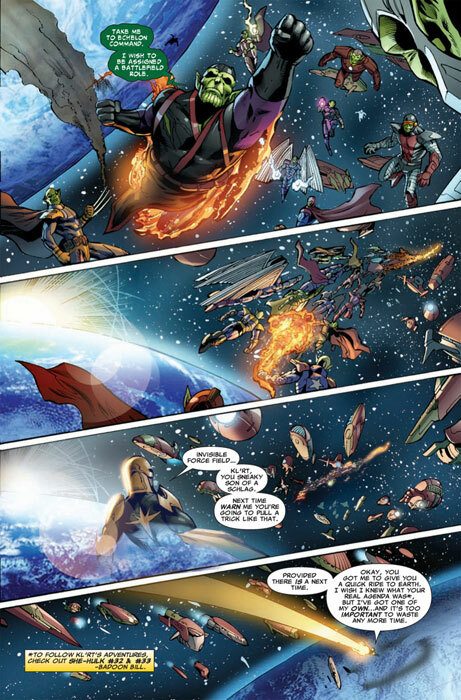 Nova Skrull has a one-panel appearance at the end of Secret Invasion #2! He appears as part of a group of super-powered Skrulls invading Earth. 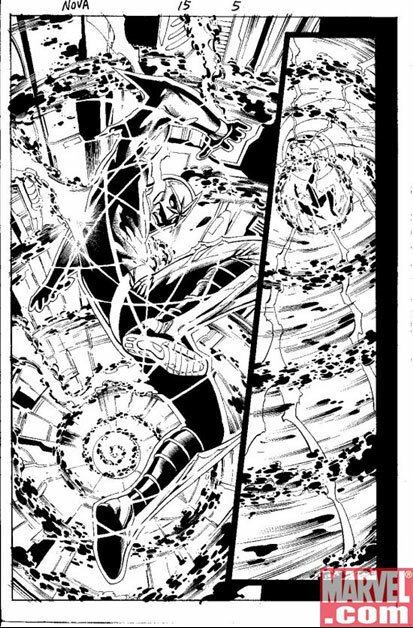 5/2/08 Preview Pages of Nova #13! 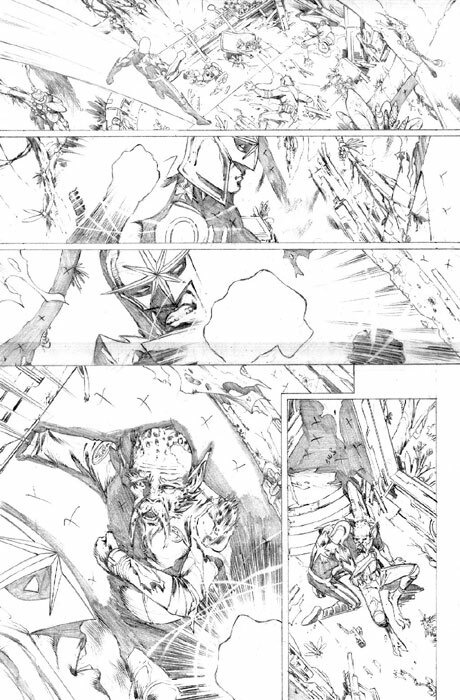 Marvel has released preview pages of art from Nova #13! The issue is written by Dan Abnett and Andy Lanning and art by Wellinton Alves and Scott Hanna. It's on sale May 7th! Reserve your copy today! 4/29/08 Updated Nova #11 Sales Ranking! Nova #11 was ranked #70 according to sales numbers released by Diamond Comics Distributors. The estimated number of issues sold was 28,155. 4/27/08 Changes to the Hasbro Nova Action Figure! The new Nova action figure from Hasbro (originally scheduled to be released in January and part of the Marvel Legends Series 4/Nemesis set) has been delayed until December. The action figure will now be available only as a Wal-Mart exclusive. Special thanks to Dean Da Costa for his help with the info. 4/18/08 Nova News from the NY Comic Con! 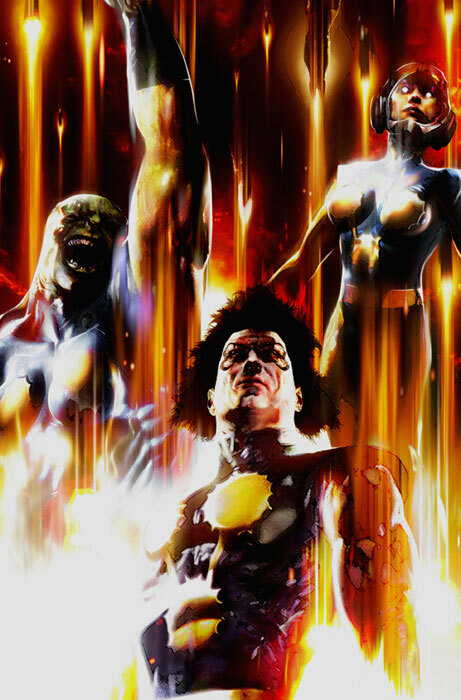 At the NYCC, Marvel gave some details on Nova's involvement in this summer's Secret Invasion event along with some preview art. New Avengers #43 will show the connection between Secret Invasion and the characters from Annihilation. Nova #16 - #18 are also related to the event. 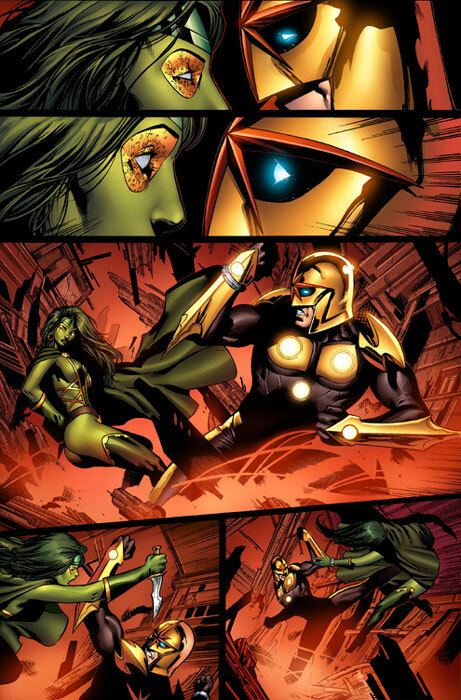 Nova's editor, Bill Rosemann, revealed that "the events of Nova #16 lead into the events of She-Hulk #32." 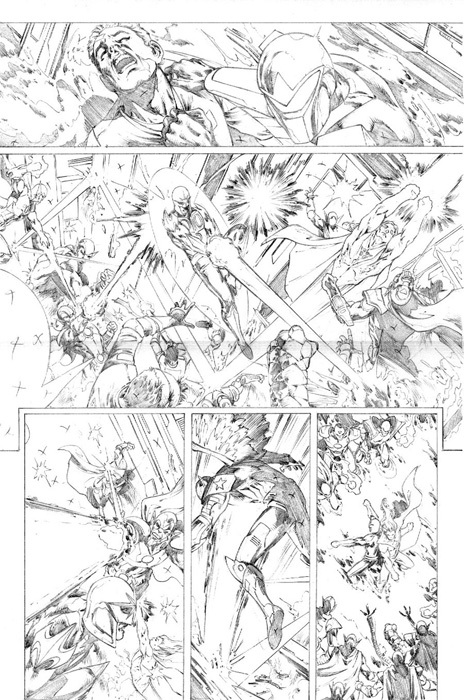 Preview art from both Nova #13 and #14 (pencils) were shown. Nova #15 - Written by Dan Abnett and Andy Lanning, pencils by Wellinton Alves with cover by Alex Maleev. 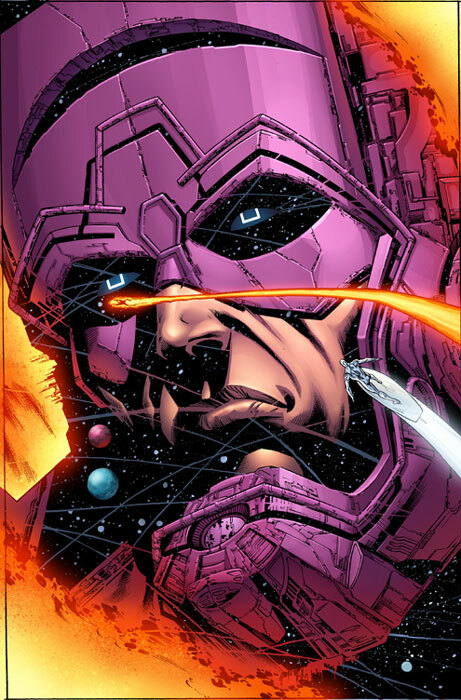 Face-to-really-big-face with Galactus! He's attempted to save evacuees, he's tried to bring down a horrifying serial killer, he's even gone one-on-one with the Silver Surfer but now our lone space cop must take his plight directly to the Big G himself! But the question is: will this universal force of nature even listen? It's got Galactus, Silver Surfer, Nova, crazy twists and pretty art - so don't you owe it to yourself to check out the book that Ain't It Cool News says "knocked my socks off with each and every issue"? 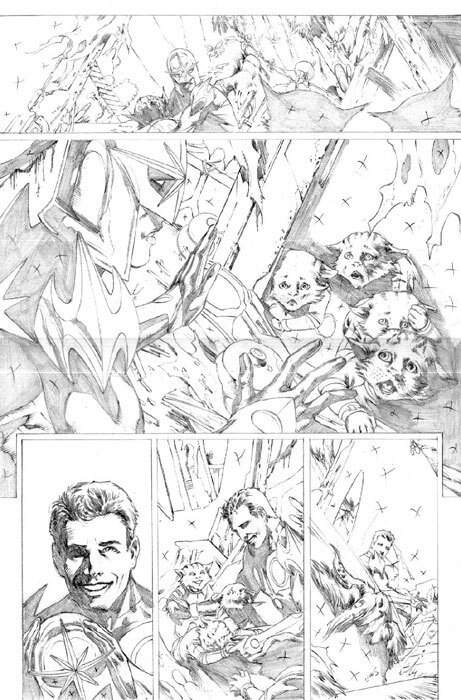 4/12/08 Preview Pages of Annihilation Conquest #6! 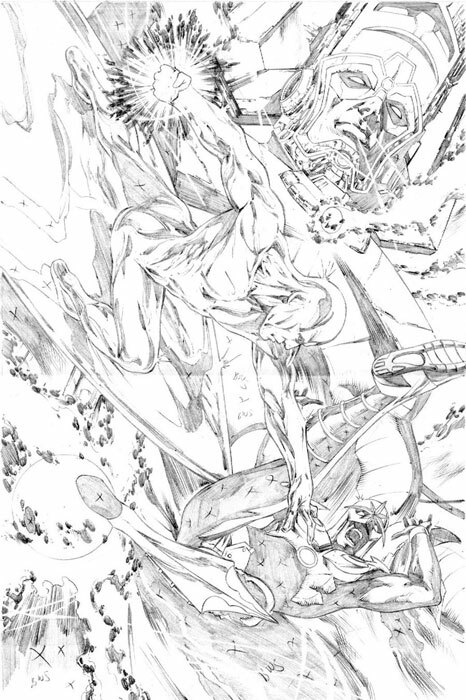 Marvel has released four preview pages of art from Annihilation Conquest #6 (including a two page spread)! The issue is written by Dan Abnett and Andy Lanning and art by Tom Raney and Wellinton Alves. Reserve your copy today! 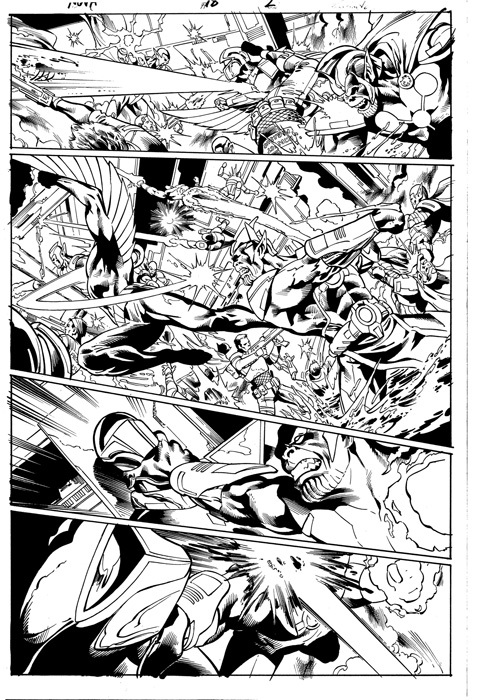 4/9/08 More Preview Pages of Nova #12! 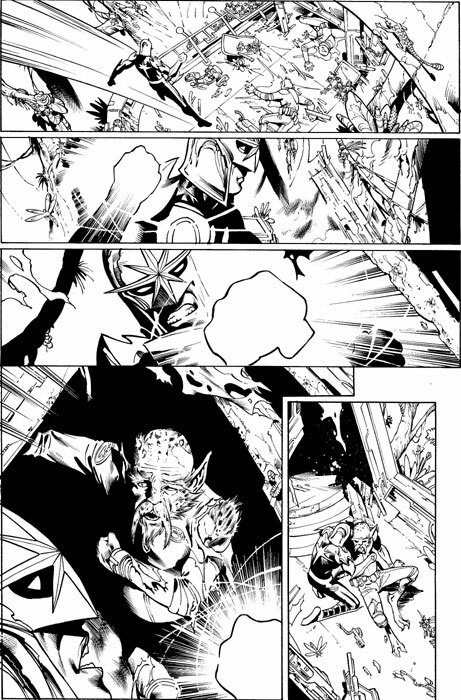 Nova's editor, Bill Rosemann, sent some preview pages of art from Nova #12! 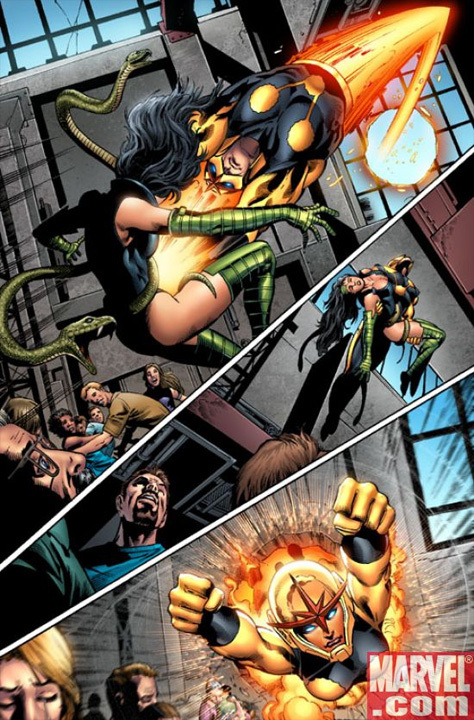 The issue is written by Dan Abnett and Andy Lanning and art by Paul Pelletier. It goes on sale today! Run, don't walk, and pick up a copy! 4/8/08 Three Preview Pages of Nova #13! 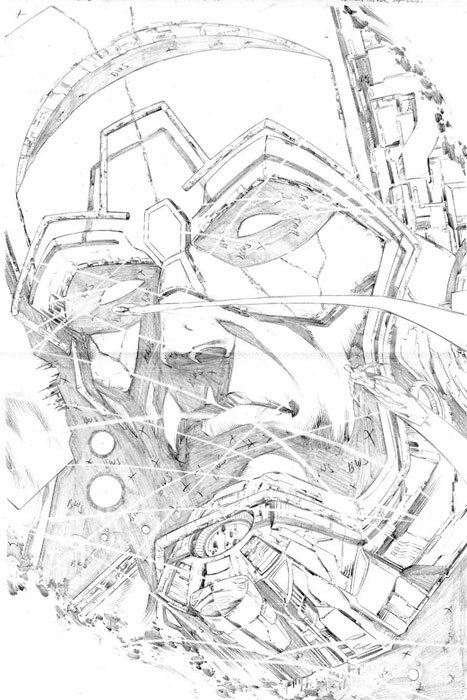 Marvel has released three preview pages of art from Nova #13! 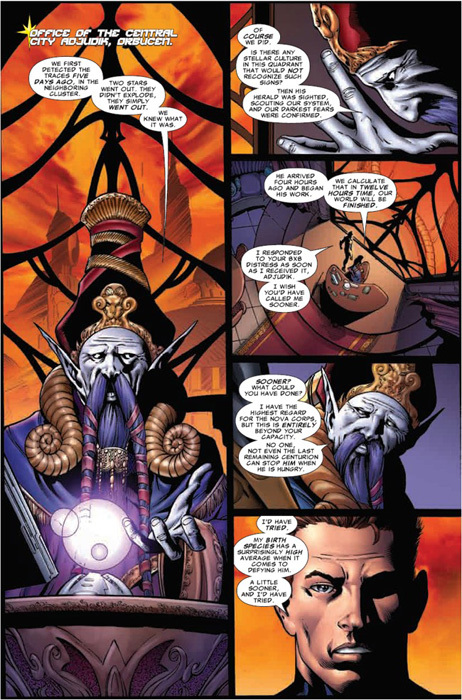 The issue is written by Dan Abnett and Andy Lanning and art by Wellinton Alves. Along with the art, marvel.com's Ben Morse has a great interview with the creative team about the issue! Nova #13 goes on sale May 7th! Reserve your copy today! 3/21/08 Nova Annual #1 Sales Ranking! Nova Annual #1 was ranked #76 according to sales numbers released by Diamond Comics Distributors. The estimated number of issues sold was 26,256. 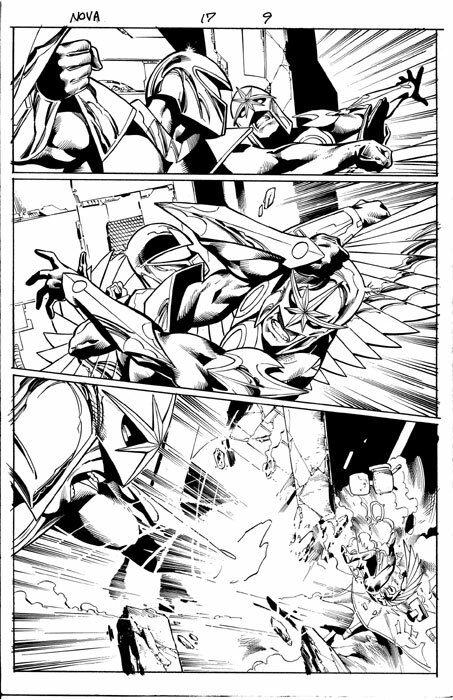 3/18/08 Updated Preview Pages of Nova #12! 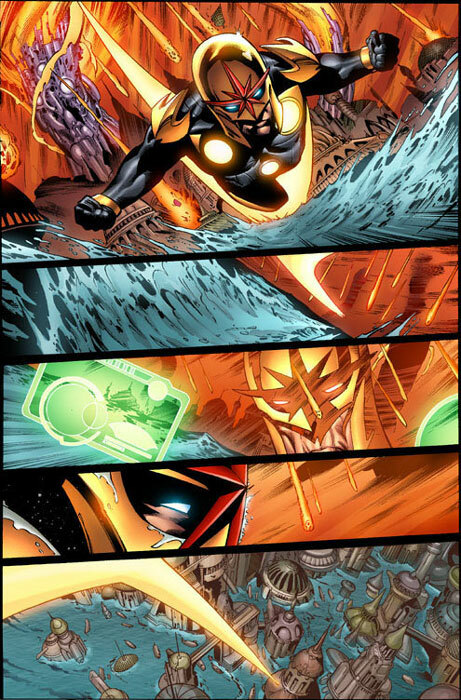 Marvel has released colored pages of art from Nova #12! 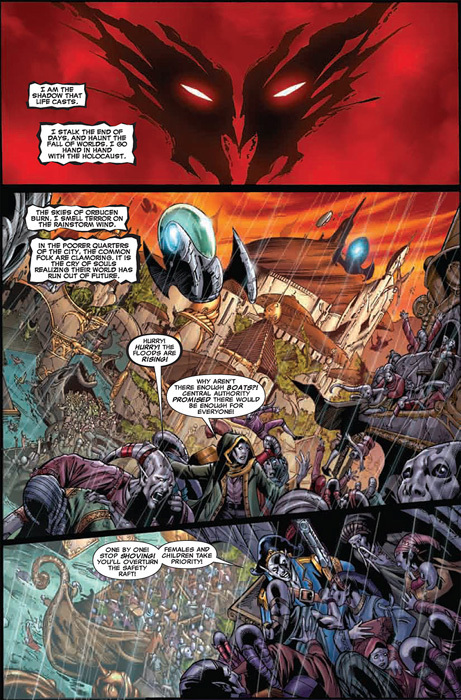 The issue is written by Dan Abnett and Andy Lanning and art by Paul Pelletier. It goes on sale April 9th! Reserve your copy today! Nova #14 - Written by Dan Abnett and Andy Lanning, pencils by Wellinton Alves with cover by Alex Maleev. 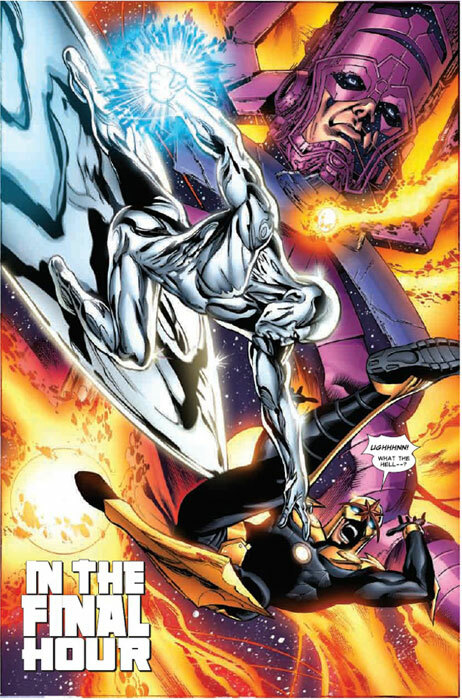 Continuing one of the wildest Galactus and Silver Surfer stories ever! He's got the power of the entire Nova Force. 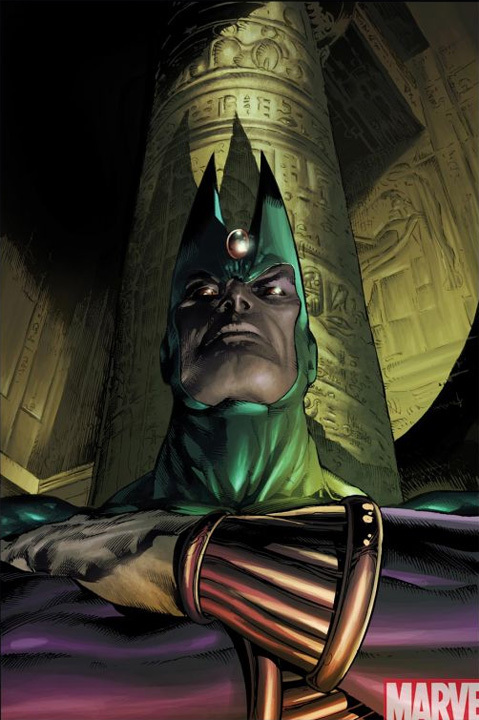 He's faced down the likes of Sphinx and Annihilus. But is the Human Rocket even in the same league as the Devourer of Worlds and his most famous herald? And what the blue blazes can Nova do when he finds himself the only thing standing between the big G and his next super-sized mega-meal? So, c'mon all you Silver Surfer & Galactus fans, take a chance on this book and find out why IGN.com says "NOVA has become one of Marvel's best new series." 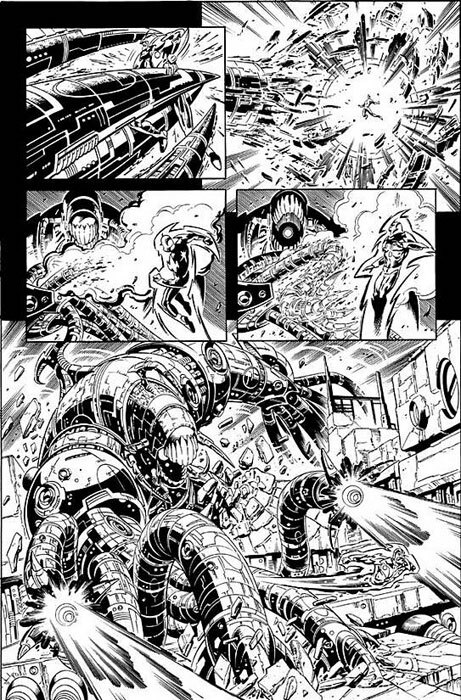 3/16/08 3 Preview Pages of Nova #12! 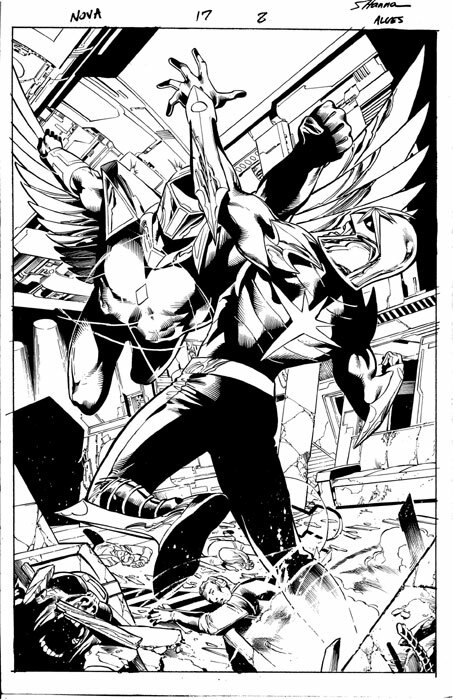 At Wizard World LA, Marvel released three pages of art from Nova #12! 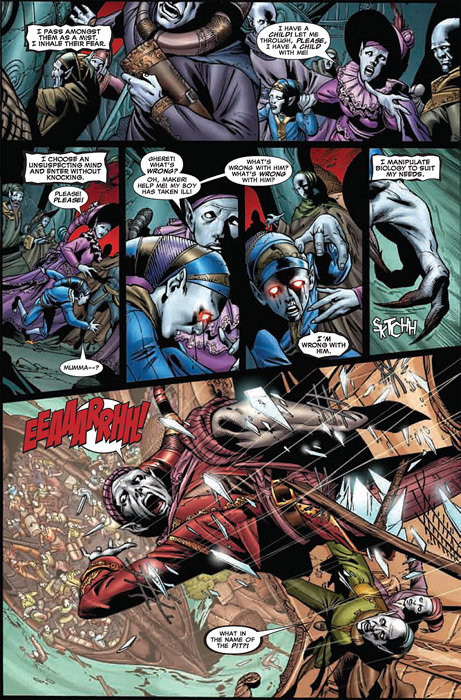 The issue is written by Dan Abnett and Andy Lanning and art by Paul Pelletier. It goes on sale April 9th! Reserve your copy today! 3/7/08 More Info on the Bowen Designs Nova Statue! Randy Bowen of Bowen Designs has confirmed that the company will be producing two Nova statues! One will be in a museum (standing) pose and the other will be in a flying pose. 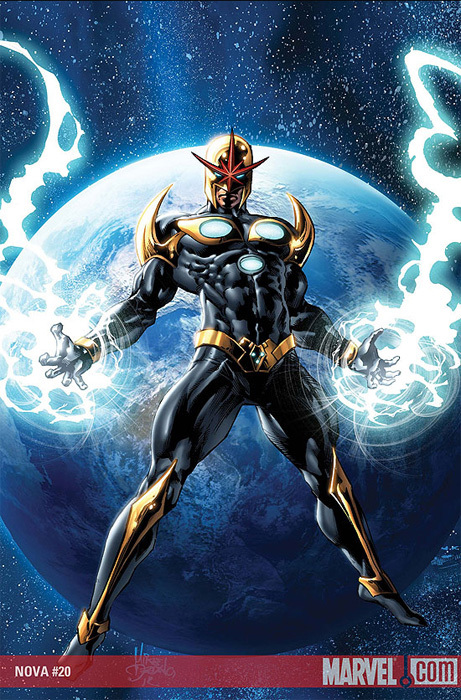 Nova (as a Skrull!) appears on the cover of the free Secret Invasion Saga comic released March 5th. 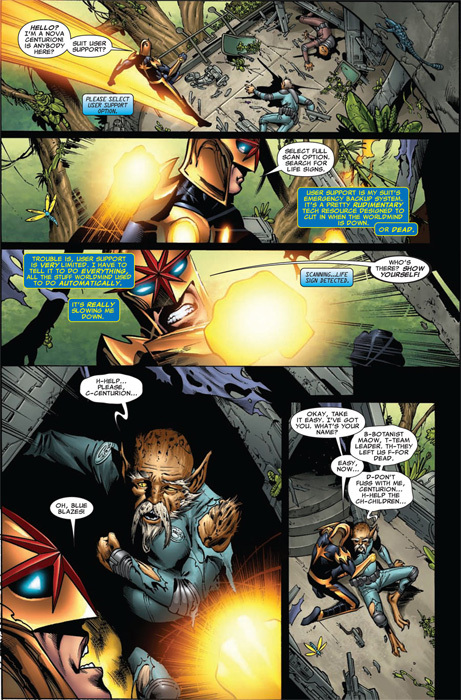 Nova is also mentioned in various parts of the book's text. 3/4/08 Updated Nova #10 Sales Ranking! Nova #10 was ranked #75 according to updated sales numbers released by Diamond Comics Distributors. The estimated number of issues sold was 29,397. 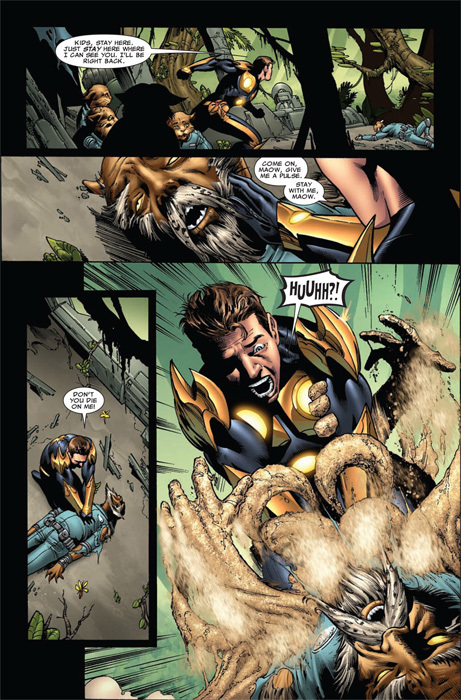 Nova has a one-panel cameo in Black Panther Annual #1. 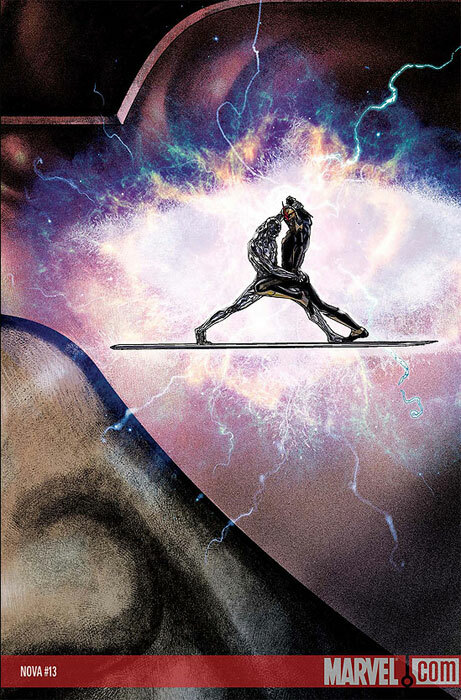 His appearance is part of a vision of the Black Panther's possible future. Special thanks to Hank Driskill for the heads-up! 2/27/08 Bowen Designs Nova Statue! 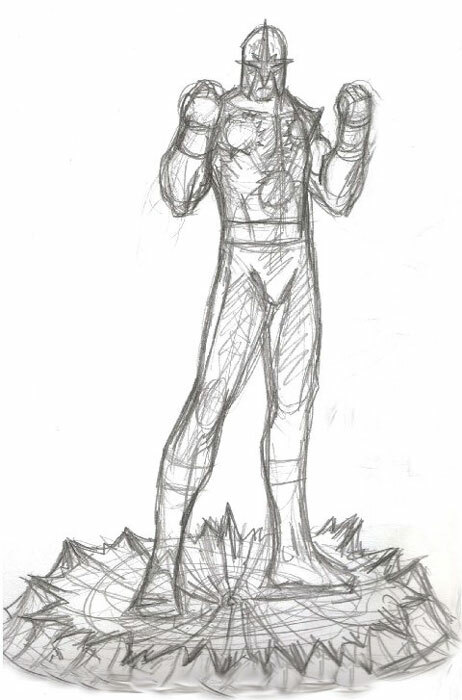 Randy Bowen of Bowen Designs has released a rough sketch of the Nova statue that will eventually be produced! Please note that this is not necessarily the final design as modifications are typical for this type of product. 2/22/08 4 Pages of Nova #11! 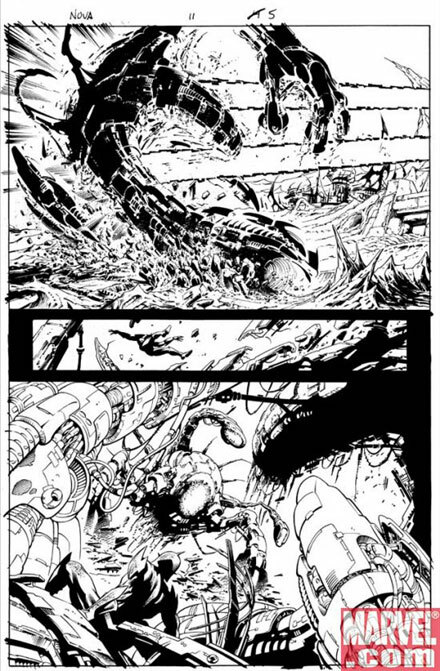 Below are four pages of art from Nova #11! 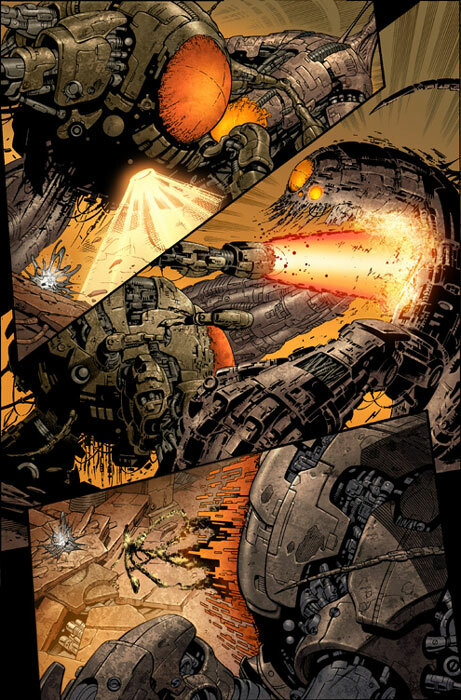 The issue is written by Dan Abnett and Andy Lanning and art by Paul Pelletier. It goes on sale March 12th!! Reserve your copy today! Art is courtesy of Marvel and Bill Rosemann. Nova #13 - Written by Dan Abnett and Andy Lanning, pencils by Wellinton Alves with cover by Alex Maleev. 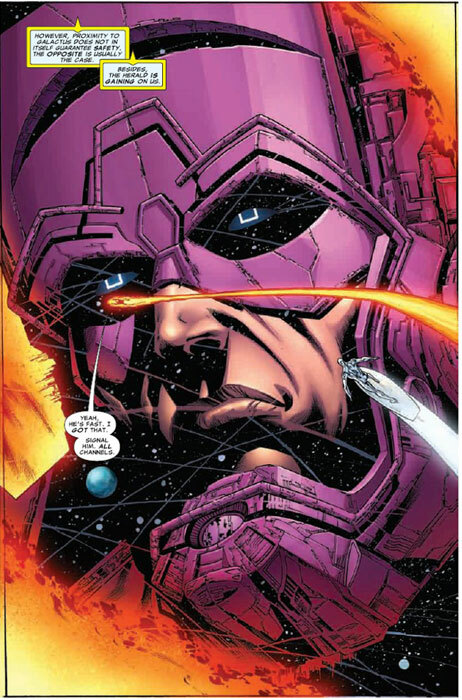 Beginning a three-part adventure - starring Galactus and the Silver Surfer! Nova has received an emergency call from a planet in peril - but how do you save a world being devoured by a force of nature? Is there any way to stop the big G from eating, or do you instead try to save as many refugees as possible? And do you reach out to your former ally - who is once again a feared Herald? Whatever Nova decides, nothing will prepare him - or you - for the horror known as Harrow! With all these awesome ingredients (Galactus! 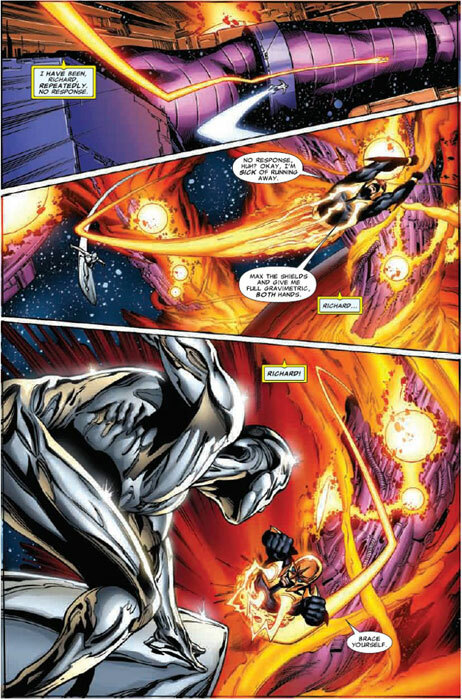 Silver Surfer! Nova! A new villain! A killer creative team! ), this is your chance to jump onboard the book that Wizard calls "one of Marvel's most consistently entertaining monthly books!" 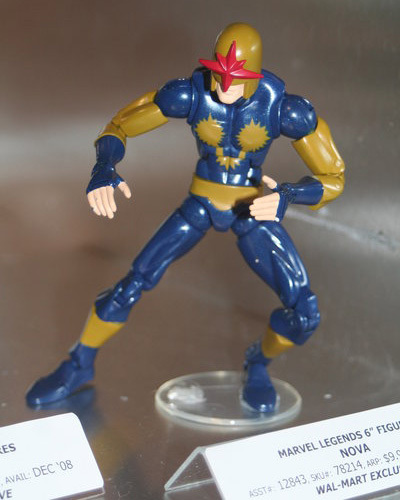 At Toy Fair 2008, Diamond Select Toys revealed a new Nova Minimate figure to be released later this year! Special thanks to David Gallaher for the heads-up! 2/11/08 A Look at Nova #11! Nova's editor, Bill Rosemann, has generously shared the cover to Nova #11 including the Nova logo and credits! 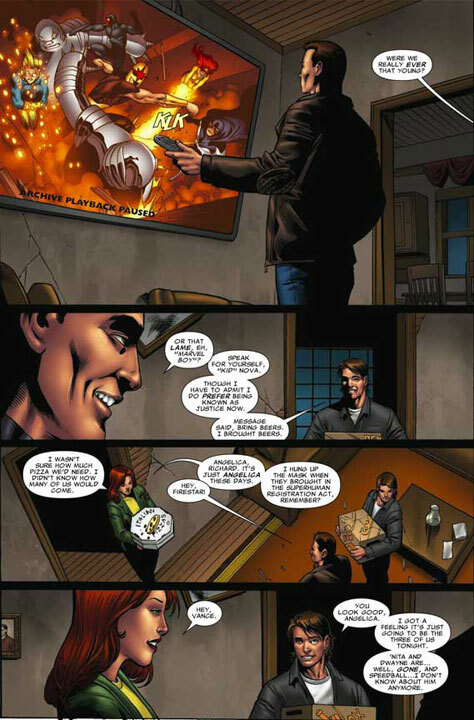 The Secret Invasion box in the corner is an ad, not a tie-in banner. Nova #11 is on sale March 12th! 2/11/08 A Look at Nova Annual #1! Nova's editor, Bill Rosemann, has generously shared the revised cover to Nova Annual #1 including the Nova logo and credits! 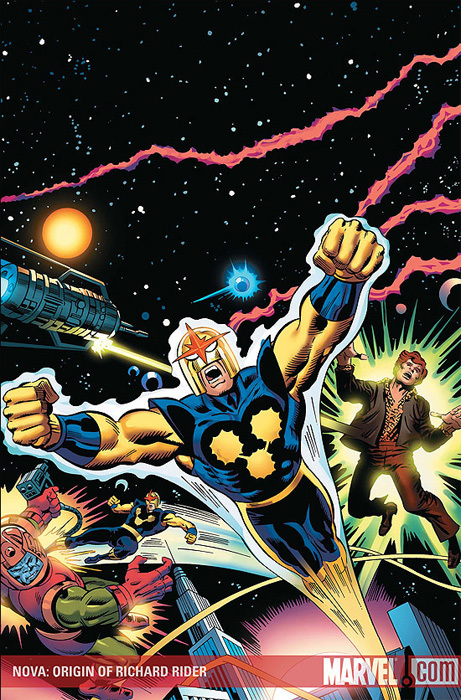 The cover is a homage to the original 'The Man Called Nova' #1. Thanks, Bill! - The annual is on sale February 13th! 2/5/08 Nova Week at the Oklahoman! Matt Price, who runs the Pop Culture section at the Oklahoman (Oklahoma City's newspaper) website, has started Nova Week in anticipation of Nova Annual #1! The event runs until the release of the annual on Feb. 13th! 2/4/08 Nova Weekend at Comic Book Resources! Comic Book Resources concludes Nova Weekend with an interview with Nova Annual #1's artist Mahmud Asrar! Go check it out! 2/2/08 Nova Weekend at Comic Book Resources! 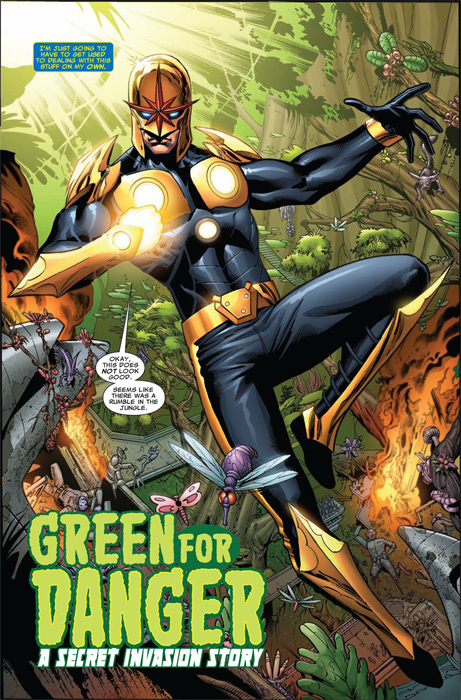 Comic Book Resources continues Nova Weekend with an interview with Nova's artist Paul Pelletier! He talks about working on Nova and Abnett and Lanning for the next couple of issues! Go check it out! The question was: "What do you think of the telepathic Russian space dog Cosmo?" 2/1/08 Nova Weekend at Comic Book Resources! 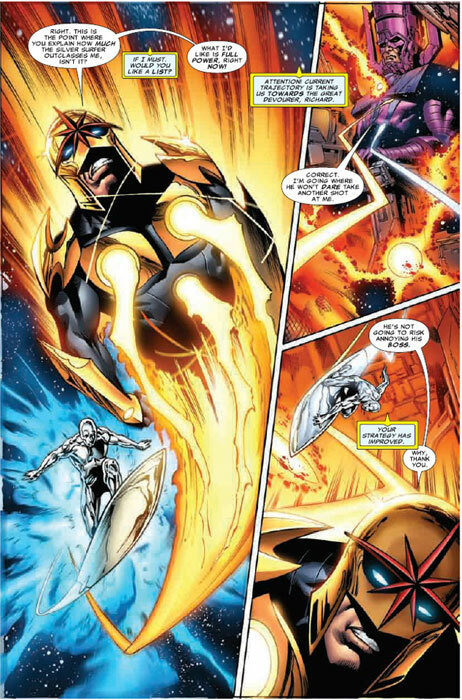 Comic Book Resources has begun Nova Weekend in an effort to focus on Nova! They kicked off with an interview with Nova's writers Dan Abnett and Andy Lanning! 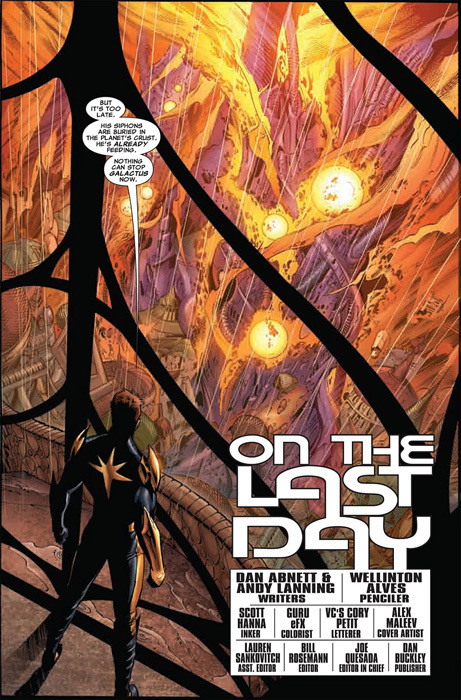 They talk about Nova role in Annihilation: Conquest and what's planned for the next couple of issues! Go check it out! 1/29/08 Updated - Nova #9 Sales Ranking! Nova #9 was ranked #83 according to sales numbers released by Diamond Comics Distributors. The estimated number of issues sold was 30,448. 1/25/08 Day 5 of Annihilation Week! Nova fan and Marvel.com Assistant Editor Ben Morse concludes Annihilation Week with an article featuring recollections of Annihilation by comic book professionals! 1/24/08 Day 4 of Annihilation Week! Marvel.com continues Annihilation Week with a fantastic, personal article by Nova fan and Marvel.com Assistant Editor Ben Morse! 1/23/08 5 Preview Pages from Nova Annual #1! Marvel has released five preview pages from the upcoming Nova Annual #1 (the character's first ever annual)! The annual retells the origin of Nova and glimpses into his future! It goes on sale February 13th! Reserve your copy today! 1/23/08 Day 3 of Annihilation Week! Marvel.com continues Annihilation Week with a great Q&A session with Nova's editor Bill Rosemann! 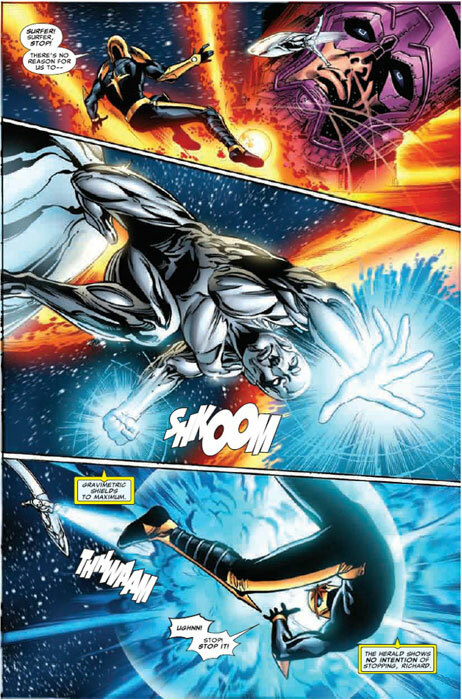 Rosemann reveals that Nova will be meeting up with Galactus and the Silver Surfer, getting involved in the Skrull's Secret Invasion and may drop by Earth in future storylines. For the full interview, read the article written by Nova fan and Marvel.com Assistant Editor Ben Morse! 1/22/08 Day 2 of Annihilation Week! Marvel.com continues Annihilation Week with their list of 'Marvel's Greatest Cosmic Characters'! Nova came in at #3! For the full list and commentary on the selections, read the article written by Nova fan and Marvel.com Assistant Editor Ben Morse! 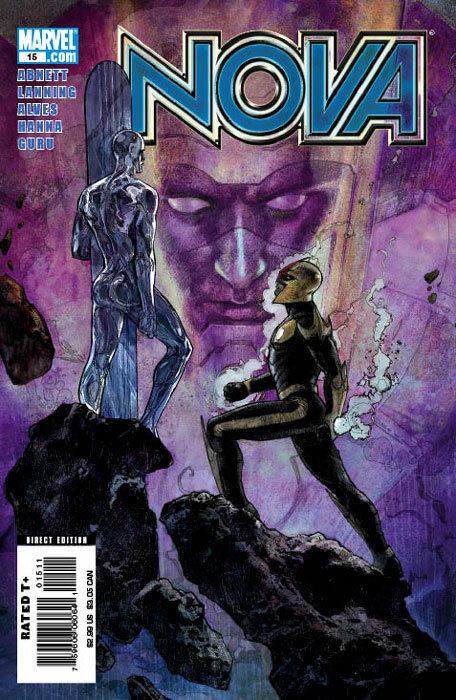 Nova #12 - Written by Dan Abnett and Andy Lanning, pencils by Paul Pelletier with cover by Alex Maleev. The New Mutant Warlock returns in an issue that propels Nova back into ANNIHILATION: CONQUEST! Still threatened by his deadly Phalanx virus, Richard Rider finally reaches Kvch, the never-before-seen Technarchy homeworld. 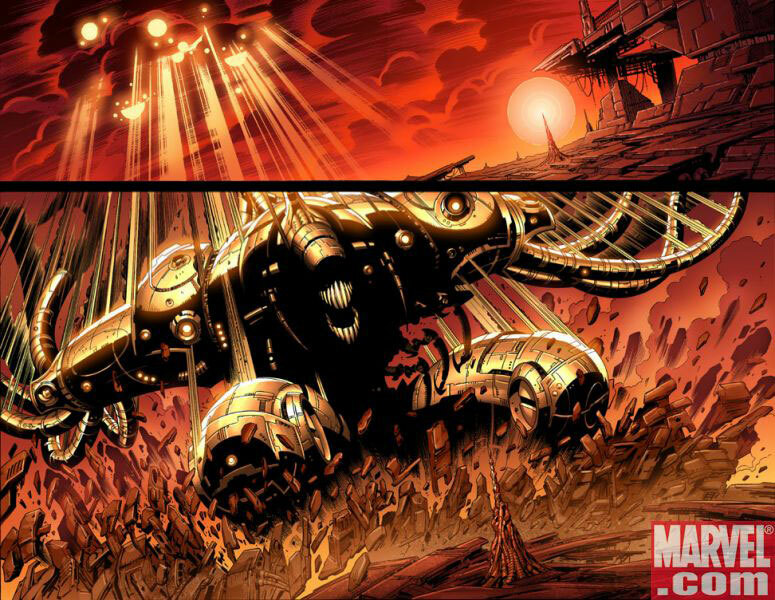 But are the "parents" of the Phalanx still there - and can Nova even reach them? And are you ready for the comeback of the former New Mutant know as Warlock? Join writers Dan Abnett & Andy Lanning and new ongoing penciler Paul Pelletier (FANTASTIC FOUR) for another chapter of the saga that has Wizard saying "If you're a fan of out-there sci-fi with a superhero twinge, you should strap yourself in for a ride with the Human Rocket's series." 1/22/08 Annihilation: Conquest #6 Solicitation! Annihilation: Conquest #6 - Written by Dan Abnett and Andy Lanning, pencils by Tom Raney and Wellinton Alves with cover by Aleksi Briclot. 1/21/08 Annihilation Week at Marvel.com! Marvel.com has begun Annihilation Week in an effort to focus on Nova and Annihilation: Conquest! They kicked off with the announcement of an Annihilation: Conquest spinoff series. 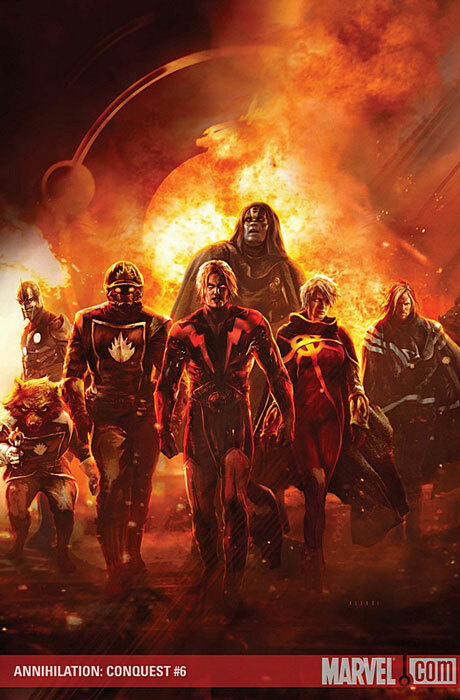 The new Guardians of the Galaxy series will not feature Nova as a member. 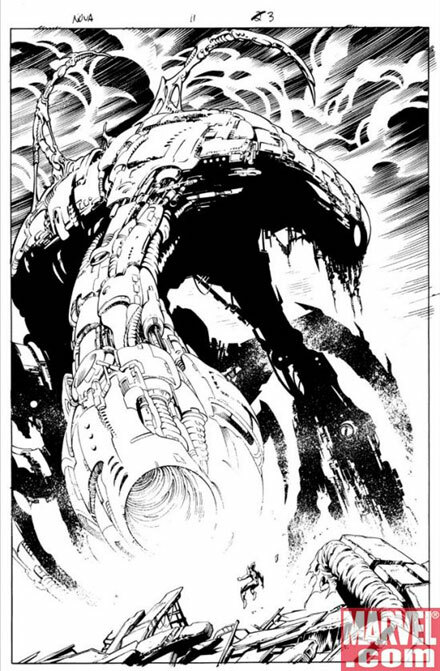 Along with an article by Nova fan and Marvel.com Assistant Editor Ben Morse, five pages from Nova #11 were released! Go check it out! Info and art are courtesy of marvel.com. 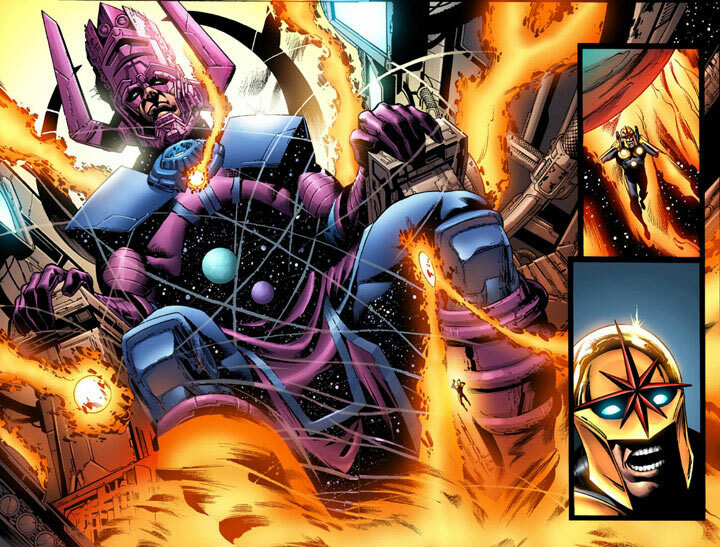 Nova appears in the main Annihilation: Conquest mini-series for the first time since the Prologue! He returns in #6 (the final issue) and it goes on sale in April. 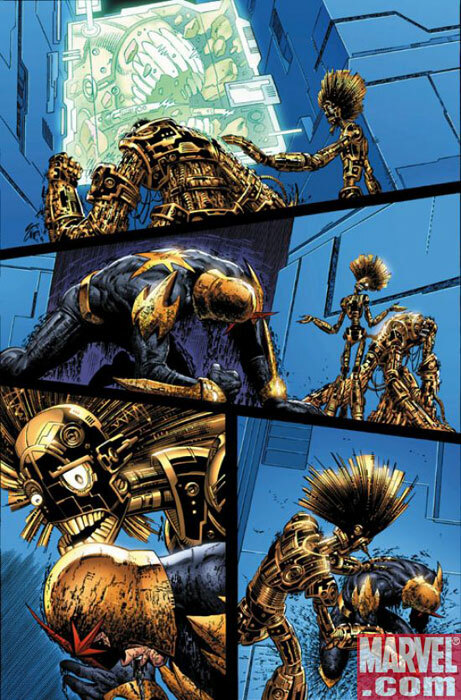 Nova appears in Cable & Deadpool #48 as one of many Deadpool versions of the Marvel super-heroes that are created from Deadpool's soul after it is shattered while Deadpool was fighting T-Ray. Special thanks to Ron Peck for the heads-up! 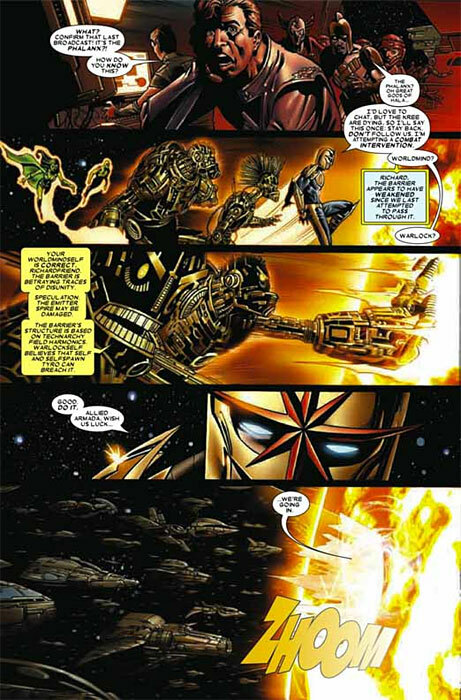 1/3/08 4 Pages of Nova #10! 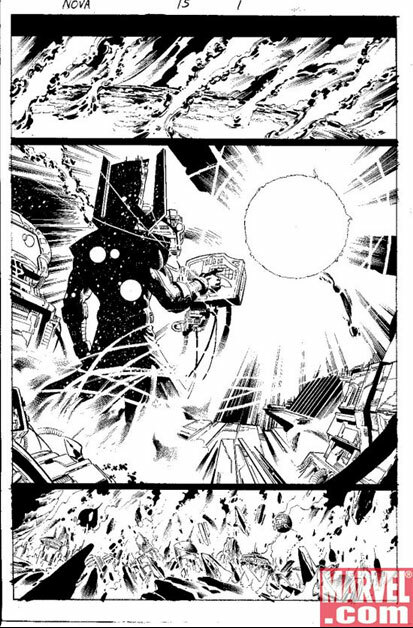 Below are four pages of art from Nova #10! 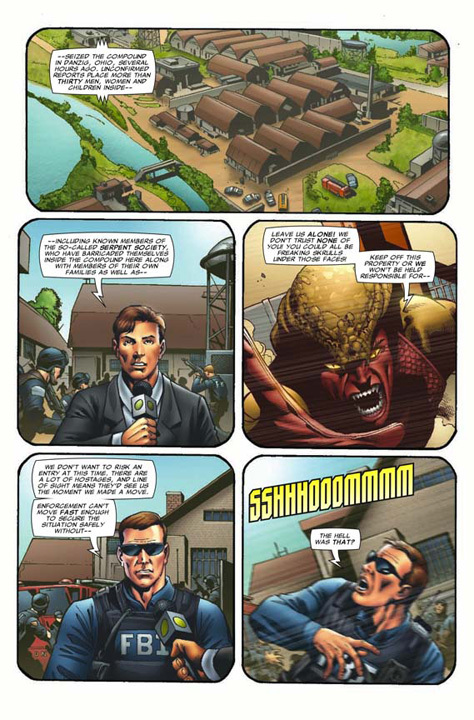 The issue is written by Dan Abnett and Andy Lanning and art by Wellinton Alves. It goes on sale January 9th!! Reserve your copy today! 1/3/08 A Look at Nova #10's Cover! Nova's editor, Bill Rosemann, has generously shared the cover to Nova #10 including the Nova logo and credits! Nova #10 is on sale January 9th! 12/29 Added International section to Products. 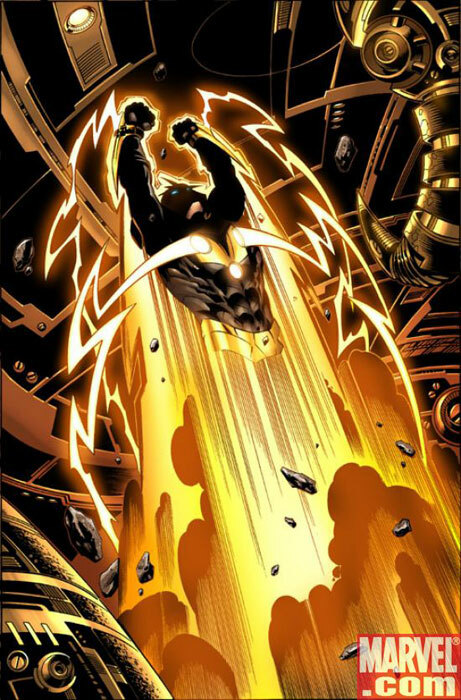 12/26 Added Nova #20's issue summary to Issues. 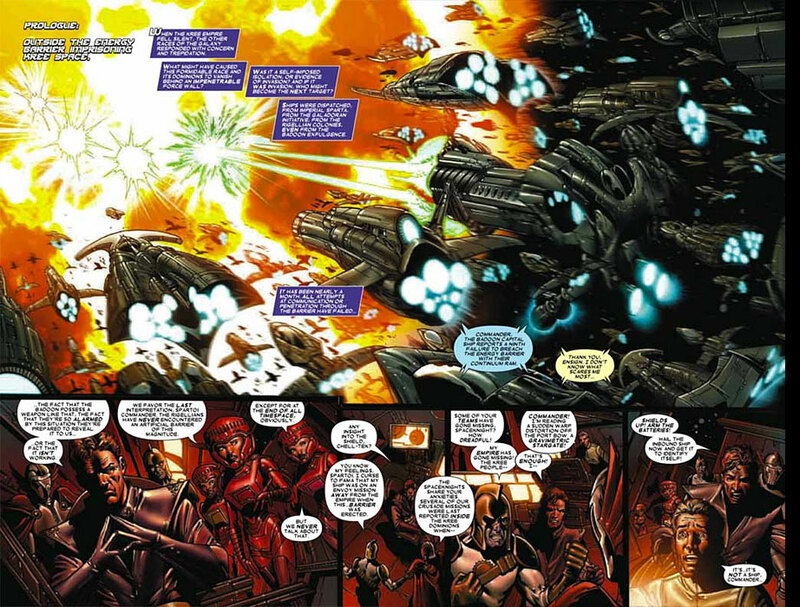 12/19 Added Nova #20 preview pages to News. 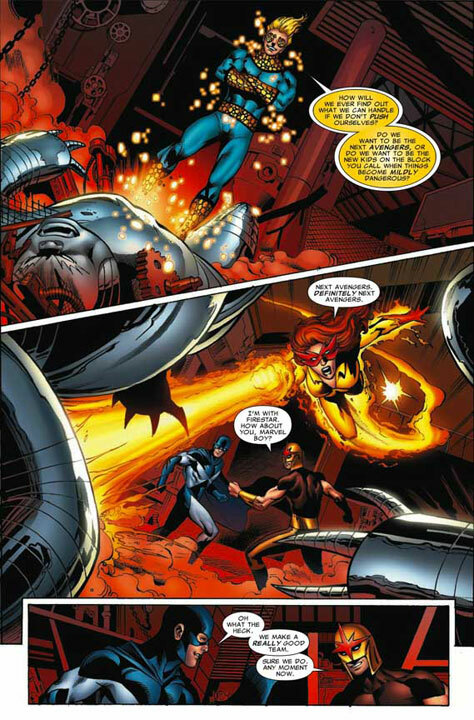 12/18 Added Nova #19's issue summary to Issues. 12/16 Added War of Kings #1 solicitation to News. 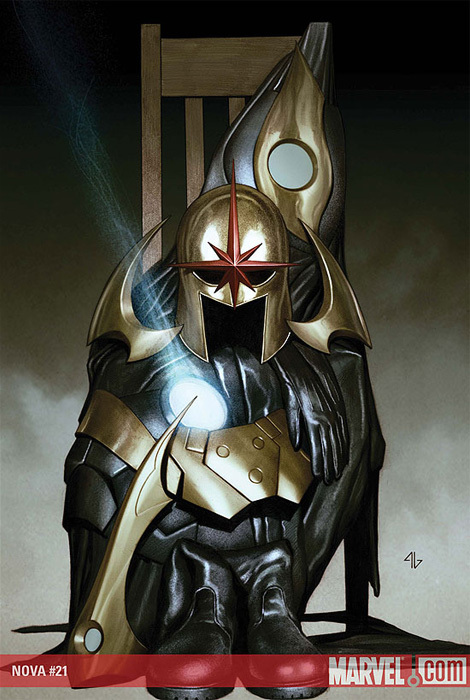 12/16 Added Nova #23 solicitation to News. 12/16 Changed poll question and posted results. 12/15 Added Nova #19 sales rank to News. 12/15 Added War of Kings covers to News. 12/11 Added Hasbro Nova update to News. 12/5 Added cover to Nova #23 to News. 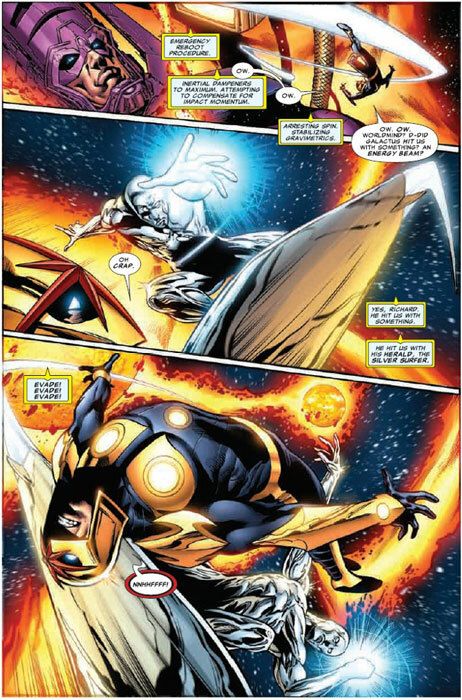 12/4 Added Nova #20 preview pages to News. 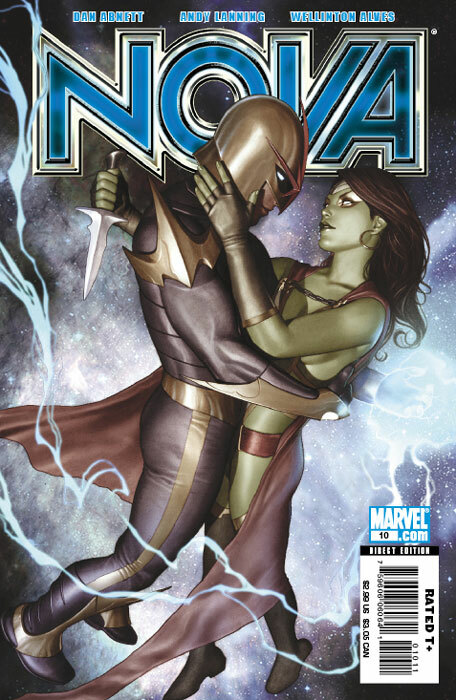 12/3 Added Nova #20 variant cover to News. 12/1 Added members to Dossier Files. 11/30 Added Kotobukiya statue info to News. 11/26 Added Chat Room to the site. 11/25 Added sketch cards to Sketchagraphs. 11/25 Added new cover to Nova #20 to News. 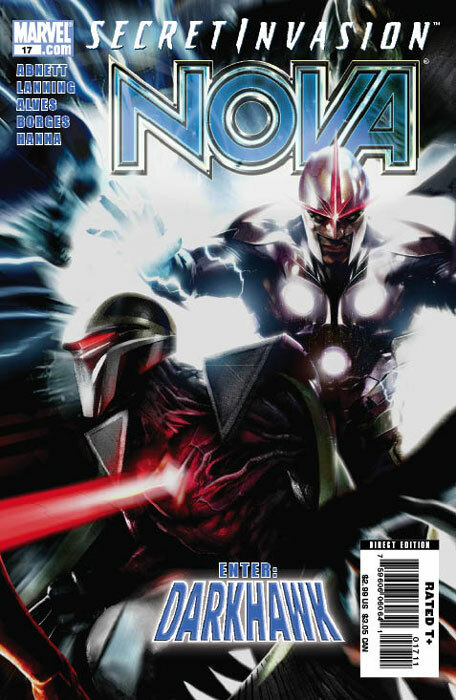 11/24 Added Nova #18's issue summary to Issues. 11/24 Added Vinnie Archer's art to FanWorks. 11/24 Added Infinity Gauntlet t-shirt to Products. 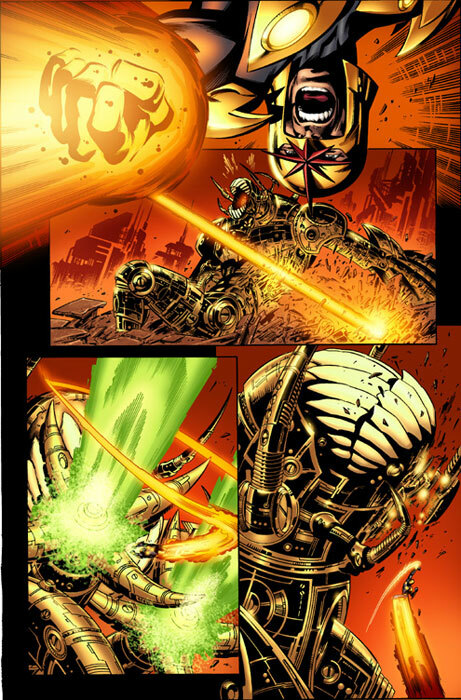 11/21 Added Nova #19 preview pages to News. 11/18 Added Nova #18 sales rank to News. 11/17 Added Nova #22 solicitation to News. 11/11 Added DnA interview to Creative. 11/8 Added Iron Man: The End #1 to News. 11/6 Added Nova #19 preview pages to News. 11/3 Added new Bowen statue photos to News. 10/24 Added Nova #18 preview pages to News. 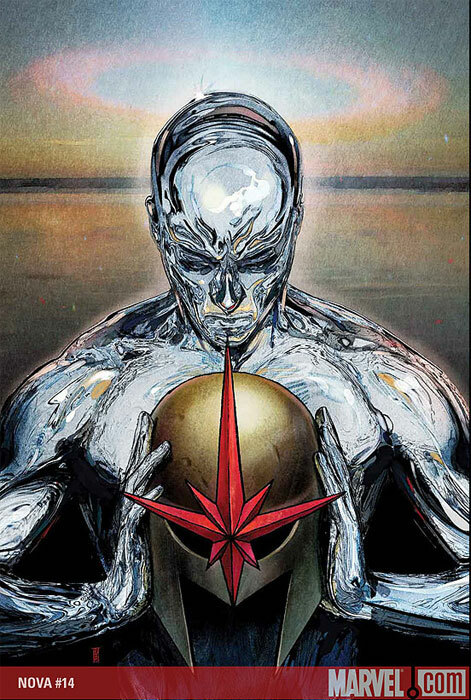 10/21 Added Nova: ORR #1 solicitation to News. 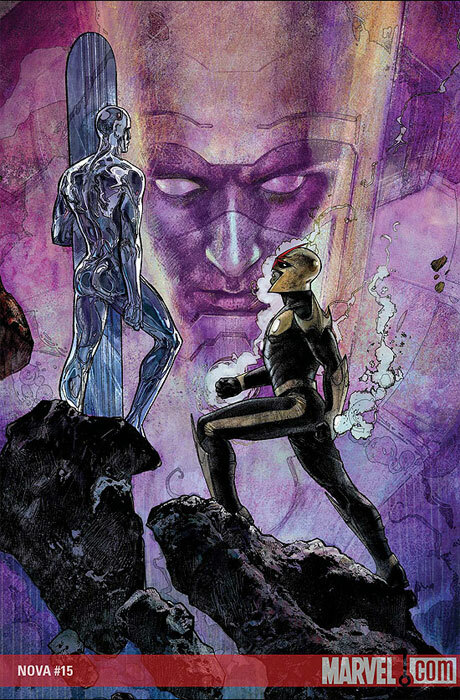 10/21 Added Nova #21 solicitation to News. 10/20 Added Nova #17 sales rank to News. 10/13 Added Nova #7 cover to Unpublished Works. 10/13 Added New Defenders to Unpublished Works. 10/13 Added sketch cards to Sketchagraphs. 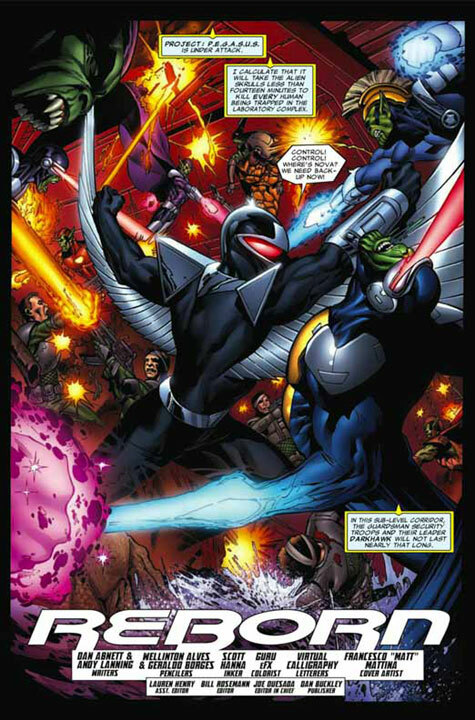 10/12 Added Nova #17's issue summary to Issues. 10/10 Added Nova #18 preview pages to News. 10/9 Added new Bowen statue photos to News. 10/8 Added Nova #18 full covers to News. 9/29 Added Nova #18 variant cover to News. 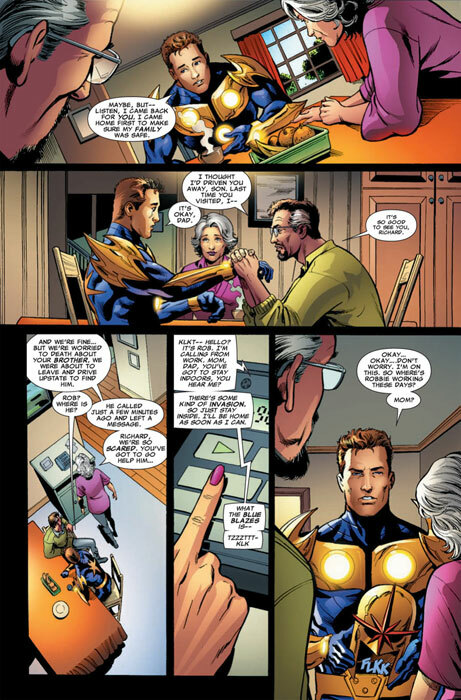 9/26 Added Nova #18 preview pages to News. 9/26 Added Bowen pre-order info to News. 9/25 Added Bowen statue 2 photos to News. 9/24 Updated Nova #16 sales number in News. 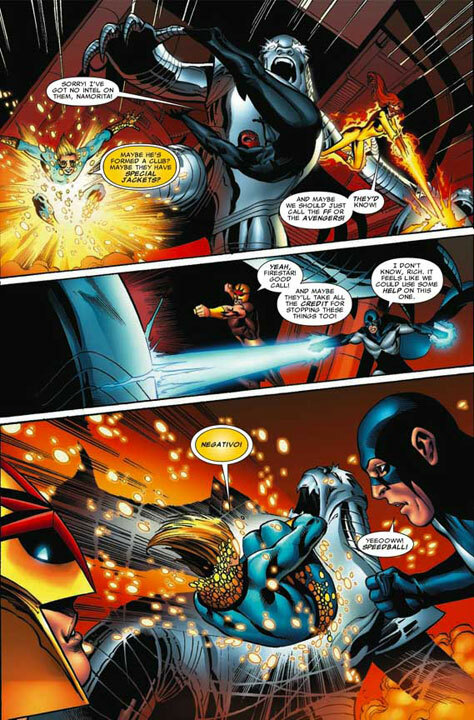 9/23 Added Nova #16's issue summary to Issues. 9/19 Added Project Fanboy Award to Awards. 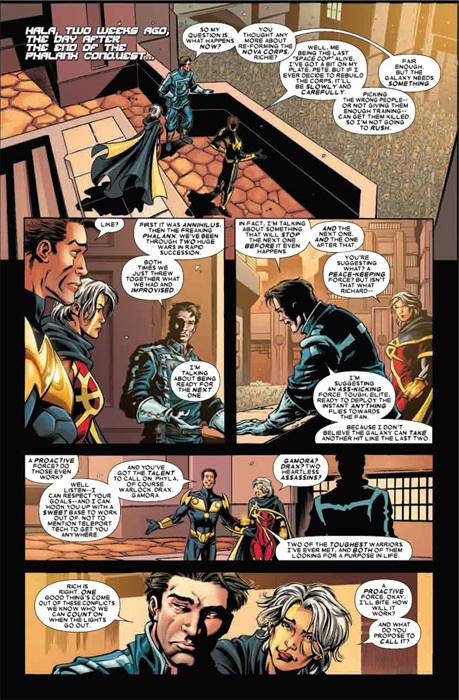 9/19 Added Nova #17 preview pages to News. 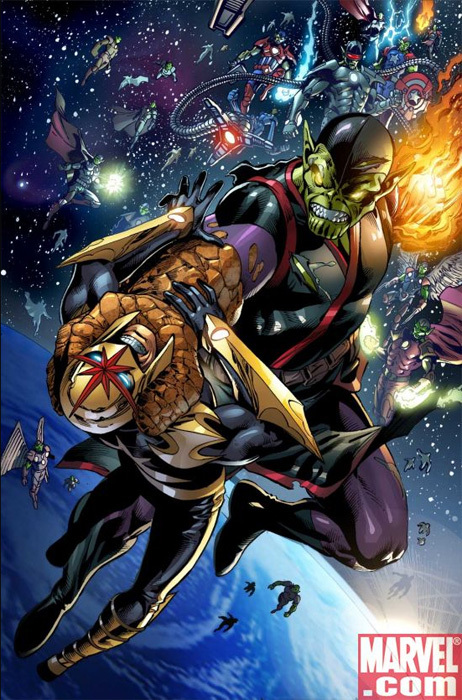 9/18 Added Nova Skrull appearance to News. 9/16 Added Nova #20 solicitation to News. 9/16 Added Nova Vol. #1 hardcover to News. 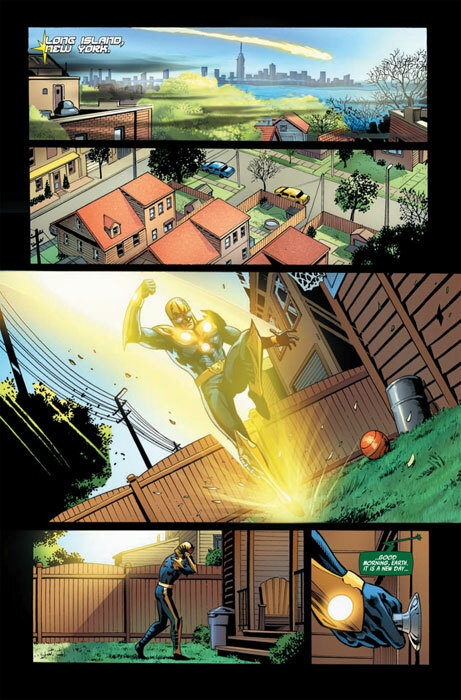 9/3 Added Nova #17 preview pages to News. 9/3 Added Nova #17 full cover to News. 9/1 Added Bowen statue photos to News. 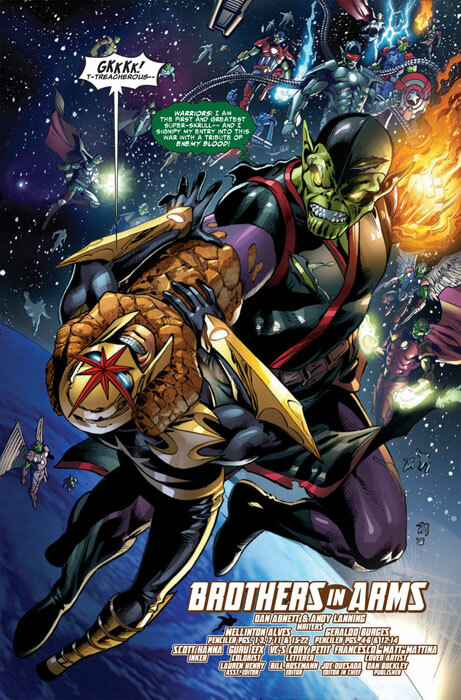 8/28 Added Nova Skrull appearance to News. 8/28 Added action figure info to News. 8/27 Added Marvel: Your Universe to News. 8/25 Added Nova #15 sales number to News. 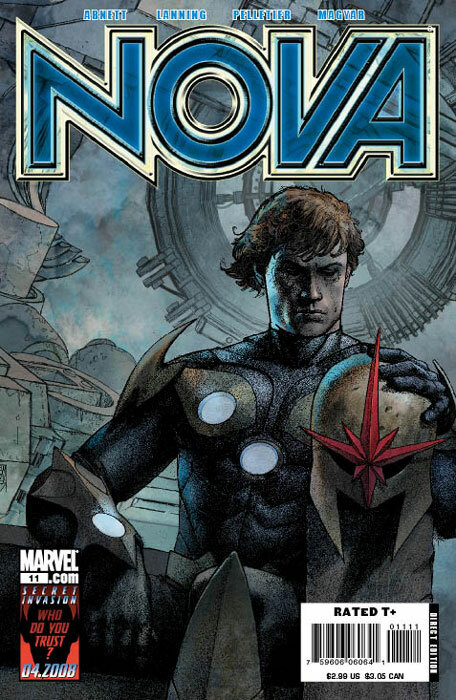 8/22 Added new Nova #17 cover & pages to News. 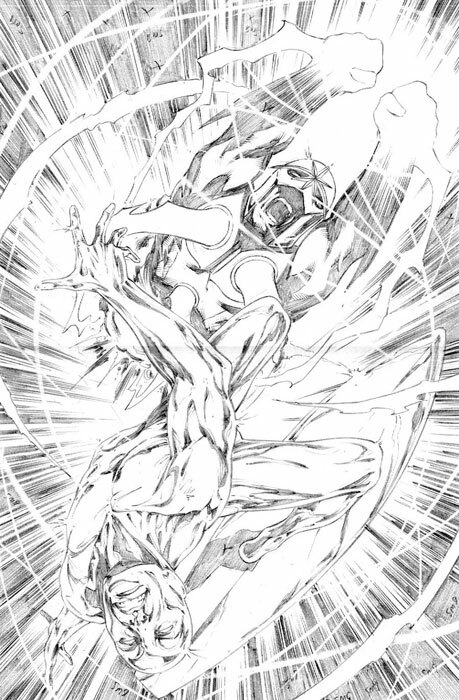 8/22 Added Nova #16 preview pages to News. 8/19 Added Nova #19 solicitation to News. 8/18 Added Nova #18 variant cover info to News. 8/18 Improved video clip in TV. 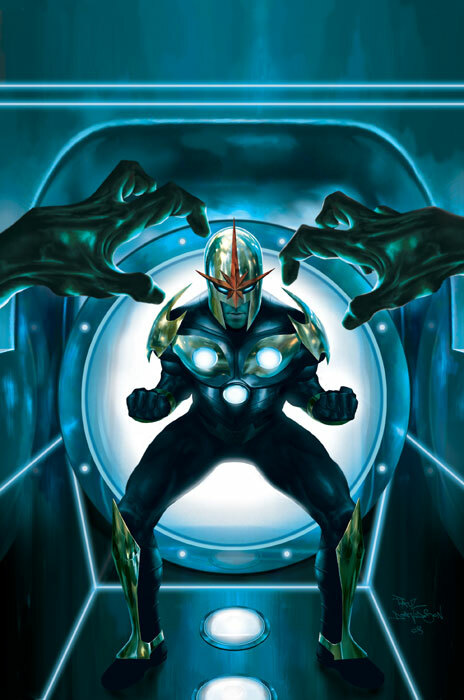 8/17 Added Nova Skrull appearance to News. 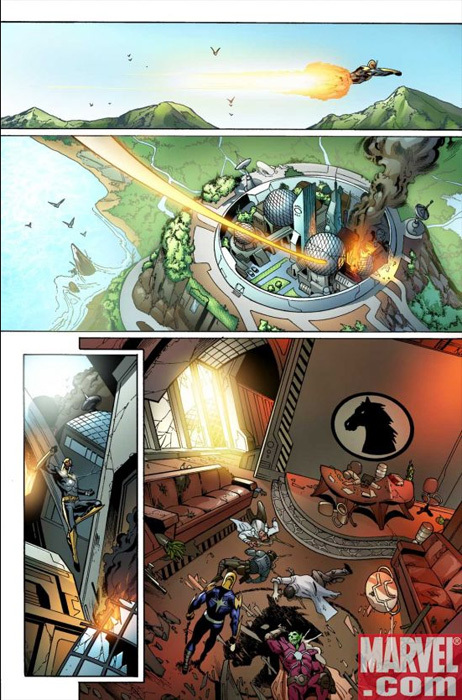 8/15 Added ad to Nova #16 to House Ads. 8/13 Added RSS Feed option to site. 8/9 Added Nova #15's issue summary to Issues. 8/6 Added SI: Frontline #2 to News. 8/5 Launched redesign of website. 8/1 Added #16 pages and #19 cover to News. 7/30 Added Nova Minimate info to News. 7/26 Added War of Kings info to News. 7/25 Added Masterpieces II card to Cards. 7/23 Added SI: Skrulls to News. 7/22 Added Nova #18 solicitation to News. 7/21 Added Nova #14 sales number in News. 7/16 Added BD Nova statue photo to News. 7/10 Added Masterpiece Nova card to News. 7/10 Changed poll question and posted results. 7/4 Added Nova #15 preview pages to News. 6/30 Added Nova #16 preview pages to News. 6/27 Added Nova #18 cover to News. 6/23 Added Nova #15 full cover to News. 6/23 Added American Dream #4 to News. 6/19 Added Nova #17 solicitation to News. 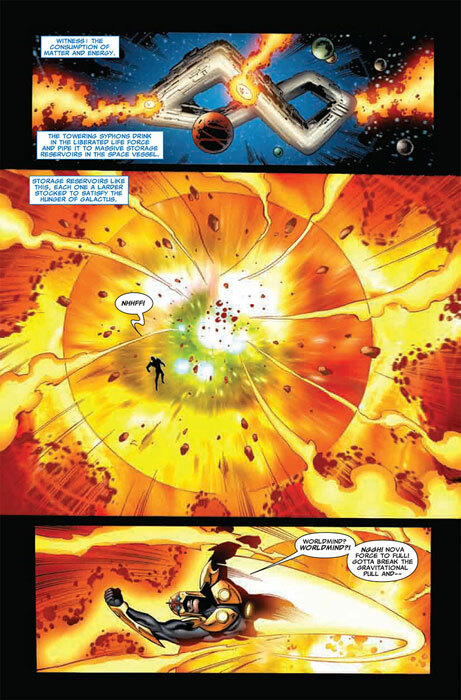 6/18 Added Nova #15 preview pages to News. 6/18 Added Nova #13 sales number in News. 6/14 Added NU: Shockfront #2 to News. 6/11 Added ToyFare #132 to News. 6/8 Added Nova #14's issue summary to Issues. 6/7 Added Nova #17 cover to News. 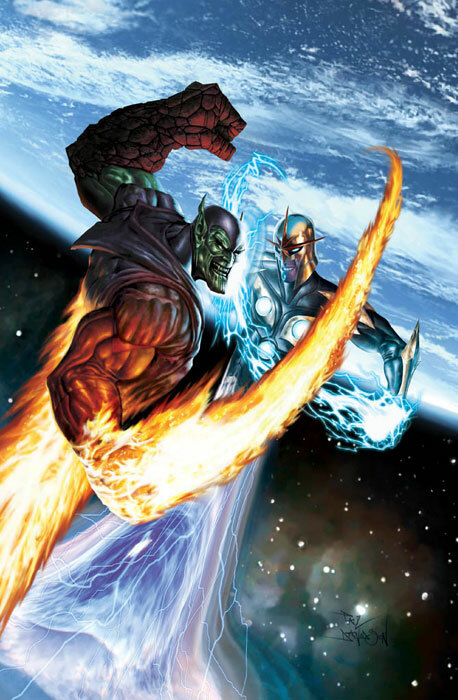 6/5 Added Nova Skrull appearance to News. 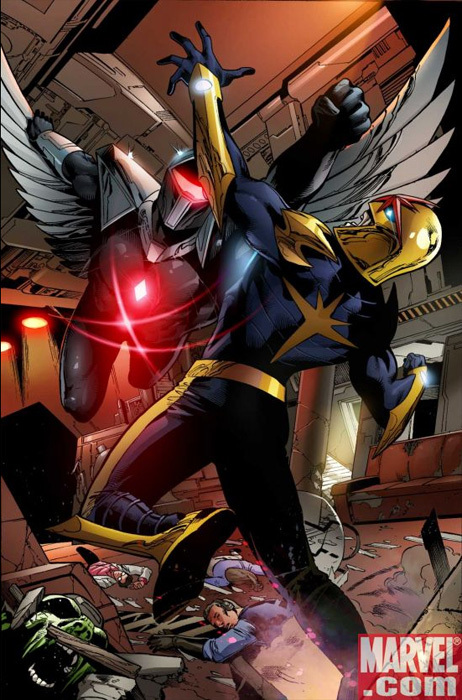 5/31 Added Nova #13's issue summary to Issues. 5/30 Added Nova #14 preview pages to News. 5/21 Added ToyFare #131 to News. 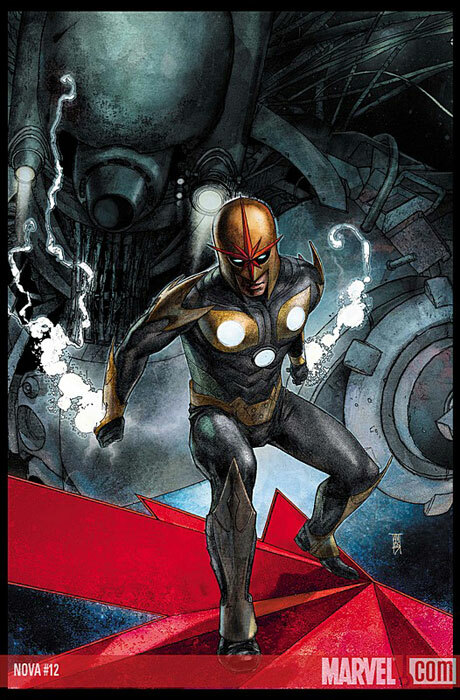 5/20 Added Nova #16 solicitation to News. 5/19 Updated Nova #12 sales number in News. 5/18 Changed poll question and posted results. 5/18 Added Last Defenders appearance to News. 5/10 Added Nova #16 cover to News. 5/10 Added Nova #14 preview pages to News. 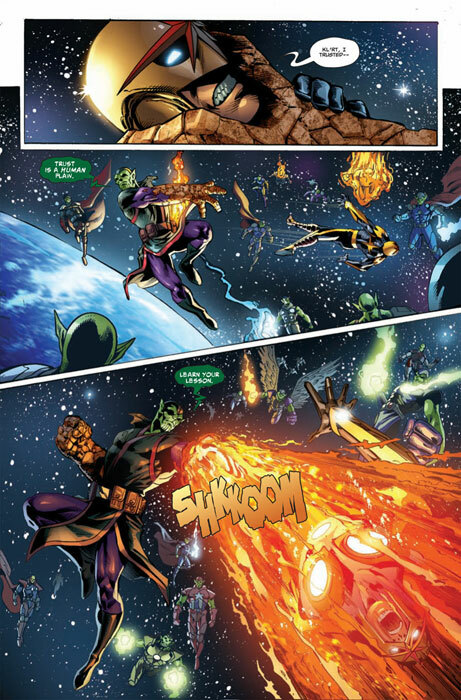 5/9 Added GOTG #1 preview page to News. 5/7 Added Nova Skrull appearance to News. 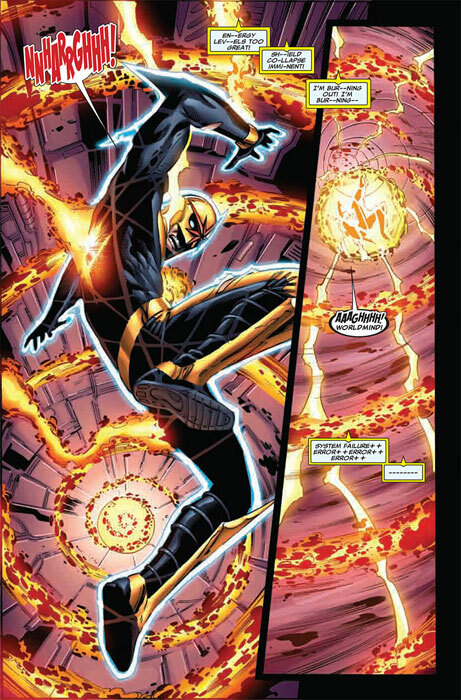 5/2 Added Nova #13 preview pages to News. 4/30 Added Nova #12's issue summary to Issues. 4/29 Updated Nova #11 sales number in News. 4/27 Added action figure info in News. 4/18 Added NY Comic Con info to News. 4/15 Added Nova #15 solicitation to News. 4/12 Added Ann. Conquest #6 pages to News. 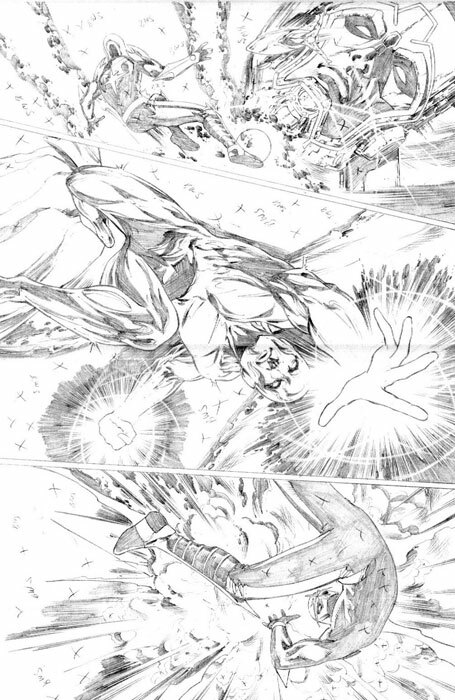 4/9 Added Nova #12 preview pages to News. 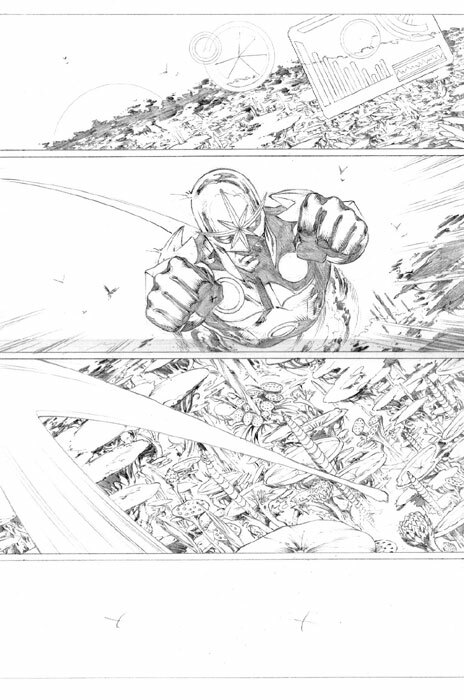 4/8 Added Nova #13 preview pages to News. 4/3 Added Nova #11's issue summary to Issues. 3/21 Added Nova Annual #1 sales number in News. 3/20 Added Annual #1's issue summary to Issues. 3/18 Added more Nova #12 pages to News. 3/18 Added Nova #14 solicitation to News. 3/16 Added Nova #12 preview pages to News. 3/7 Added Bowen Designs info to News. 3/5 Added Secret Invasion Saga to News. 3/5 Added DnA interview to Creative. 3/4 Updated Nova #10 sales number in News. 2/28 Added Black Panther Annual to News. 2/27 Added Bowen rough sketch to News. 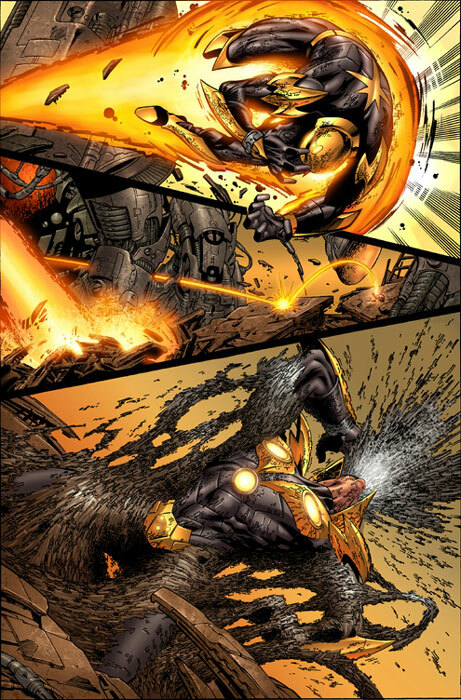 2/22 Added Nova #11 preview pages to News. 2/19 Added Nova #13 solicitation to News. 2/18 Added Nova #10 sales ranking to News. 2/17 Added Nova Minimate to News. 2/17 Added Steve Dieppa figures to FanWorks. 2/11 Added Nova #11 full cover to News. 2/11 Added Nova Annual #1 full cover to News. 2/10 Added Warriors' Mix to Awards. 2/9 Added Steve Dieppa figures to FanWorks. 2/5 Added Nova Week to News. 2/4 Added Nova Weekend - Day 3 to News. 2/2 Added Nova Weekend - Day 2 to News. 2/2 Changed poll question and posted results. 2/1 Added Nova Weekend - Day 1 to News. 1/29 Updated Nova #9 sales number in News. 1/26 Added Nova #10's issue summary to Issues. 1/25 Added Annihilation Week - Day 5 to News. 1/24 Added Annihilation Week - Day 4 to News. 1/23 Added Annual #1 preview pages to News. 1/23 Added Annihilation Week - Day 3 to News. 1/22 Added Annihilation Week - Day 2 to News. 1/22 Added Nova #12 and Annihilation: Conquest #6 solicitations to News. 1/21 Added Annihilation Week info to News. 1/21 Added Nova #9 sales ranking to News. 1/20 Added Restoration Protocols to Dossiers. 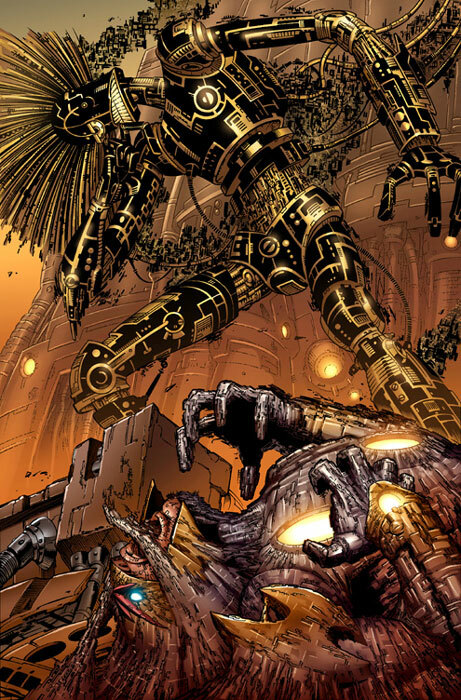 1/18 Added Annihilation: Conquest #6 to News. 1/12 Added Eaglemoss figurine to Products. 1/12 Added Cable & Deadpool #48 to News. 1/11 Added Steve Dieppa figures to FanWorks. 1/10 Added Nova Zone to Awards. 1/5 Added Nova #9's issue summary to Issues. 1/3 Added Bill Rosemann interview to News. 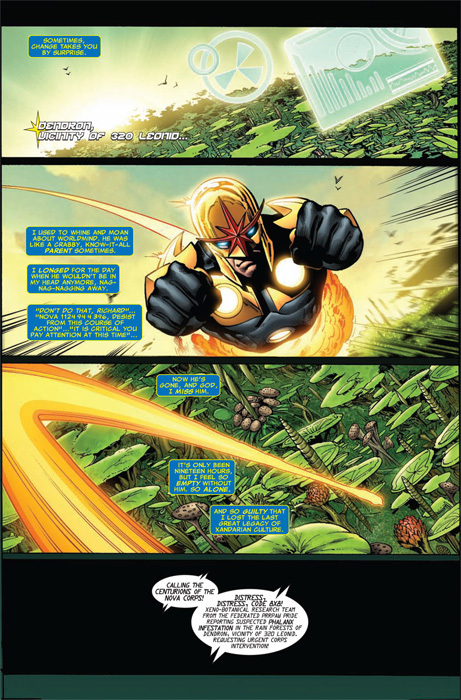 1/3 Added Nova #10 preview pages to News. 1/3 Added Nova #10 full cover to News. 1/1 Added Nova sketch cards to Products.